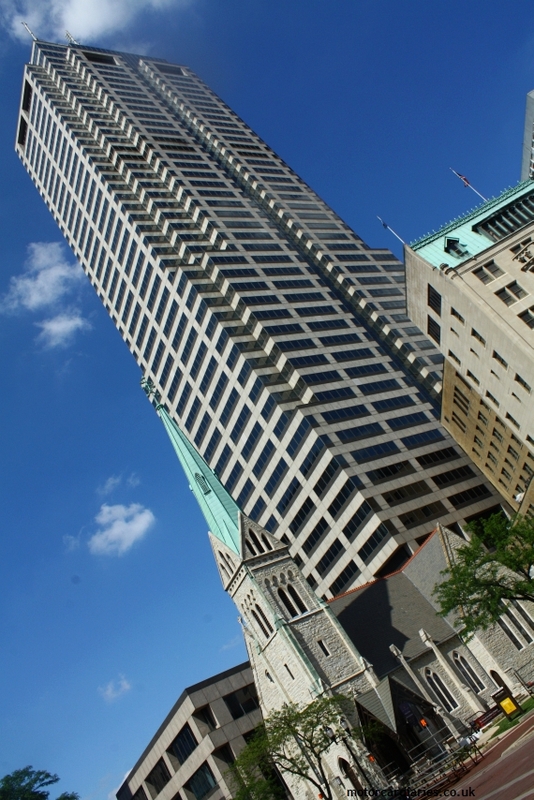 In spite of apocalyptic weather battering the US, it’s a relief to find clear skies on Saturday morning. 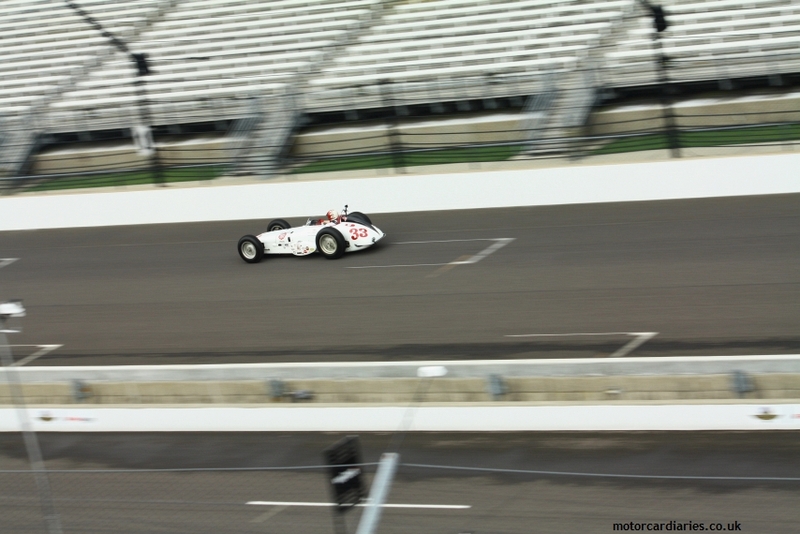 This is Legends Day at Indy and we have a relatively short time at the track to explore, orientate, absorb and revere. 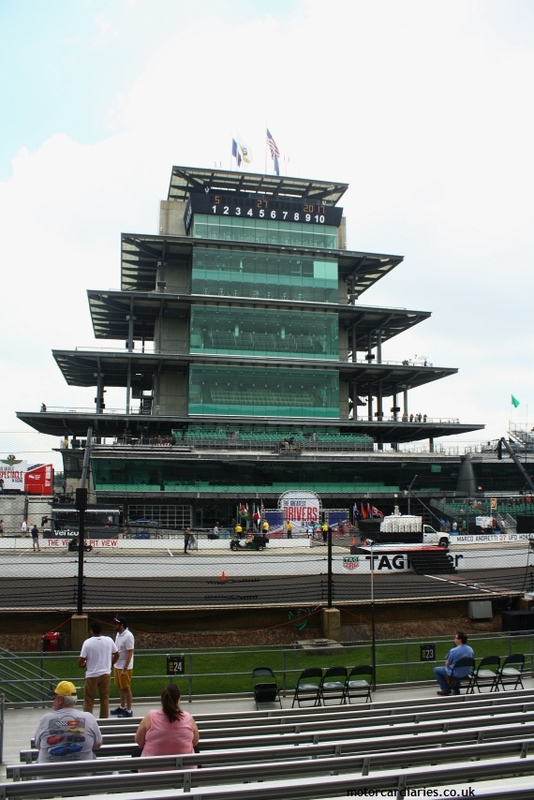 The most striking aspect of the Speedway is – as one might expect – its size. 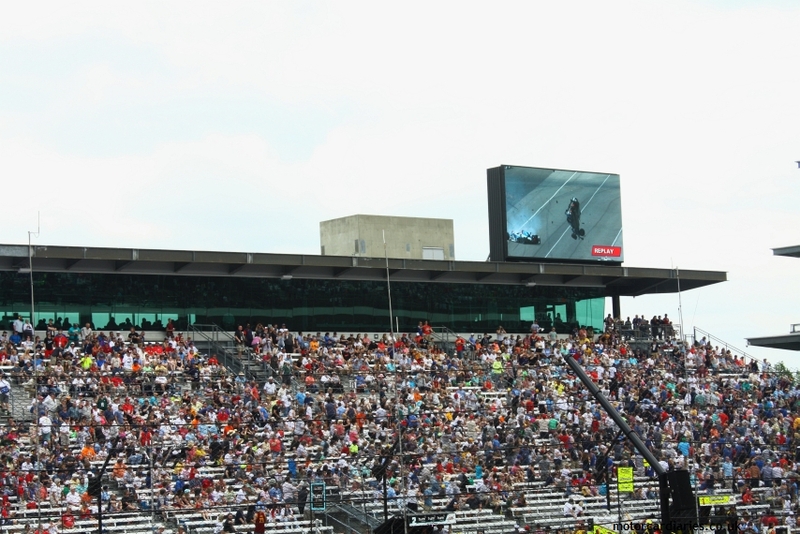 The grandstands are less looming and lofty than we found the previous weekend at Charlotte but it’s their sheer reach which is so staggering. Stand around the yard of bricks and you need to squint ahead to see turn one and behind you to pick out turn four. It is simply enormous – on a scale you can’t quite believe until you’re stood there, gazing towards the horizon in all directions. The only comparison I can make is the pit straight at Monza; no other circuit of my experience stands up as a reference in terms of pure, flat(ish) real estate. Legends Day is a pretty relaxed affair. 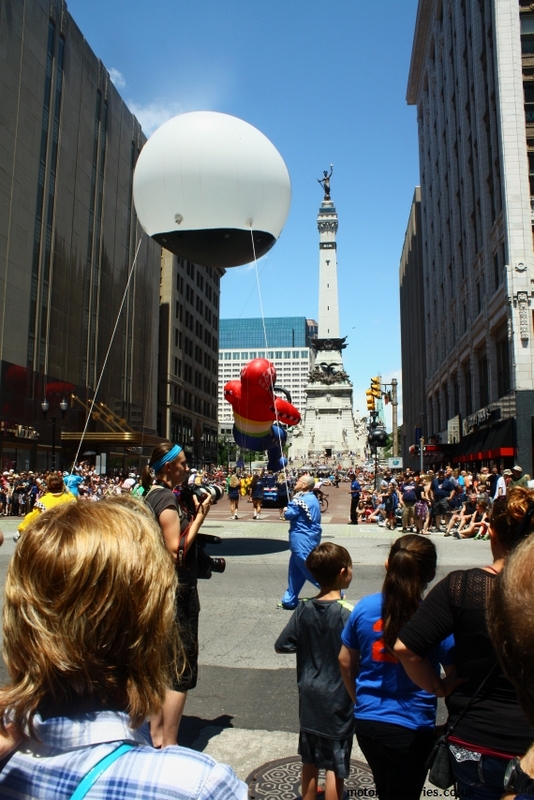 One often reads about how open and accommodating American events are, but Indy redefines how major race meetings can facilitate their fans. 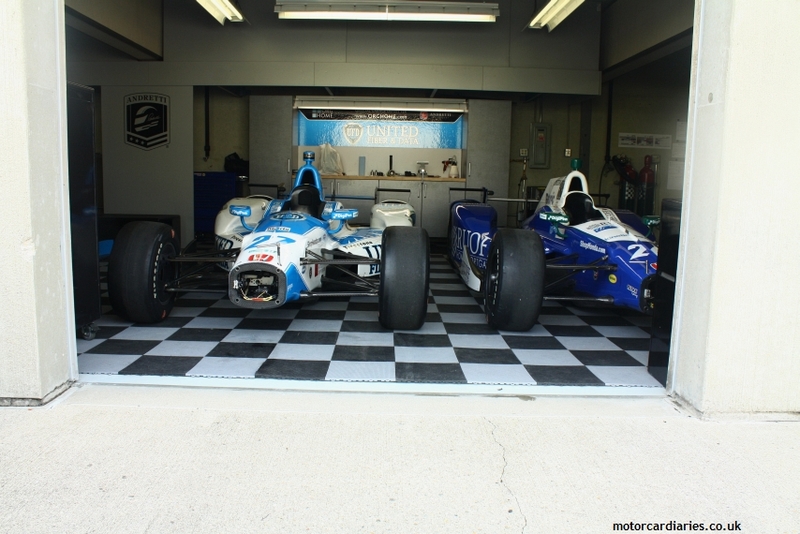 Every car is freely available to view; many of the garages are open so you can wander around. 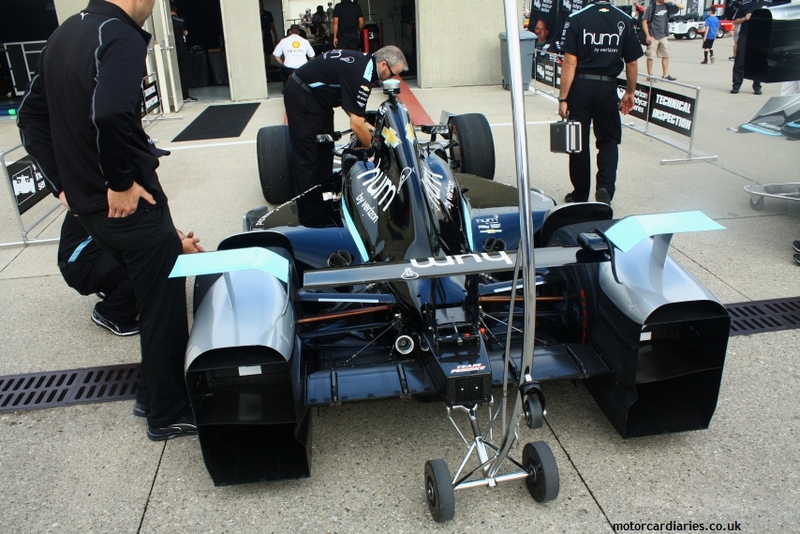 Cars rest with engine covers lying to one side to allow the earnest punter the opportunity to scope out the plumbing of the Honda and Chevy V6 motors. 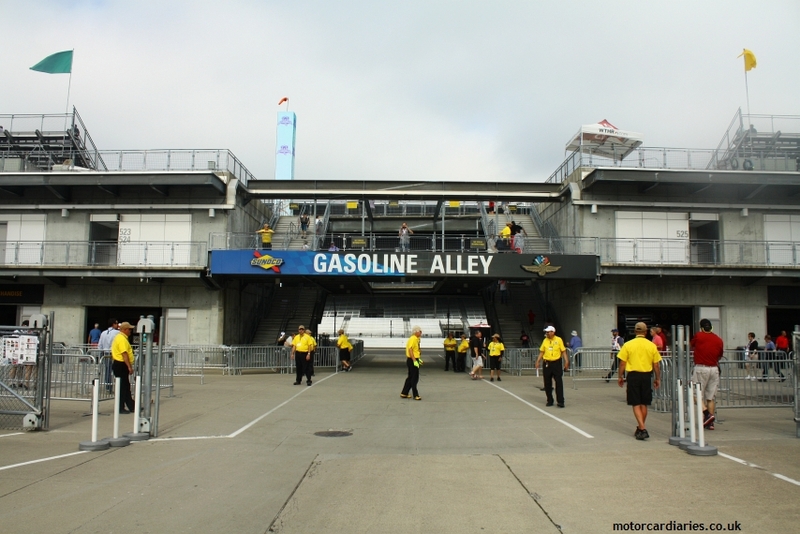 The garages sit behind the main pits – Gasoline Alley in local parlance – and all the vehicles are undergoing scrutineering ahead of the big race. 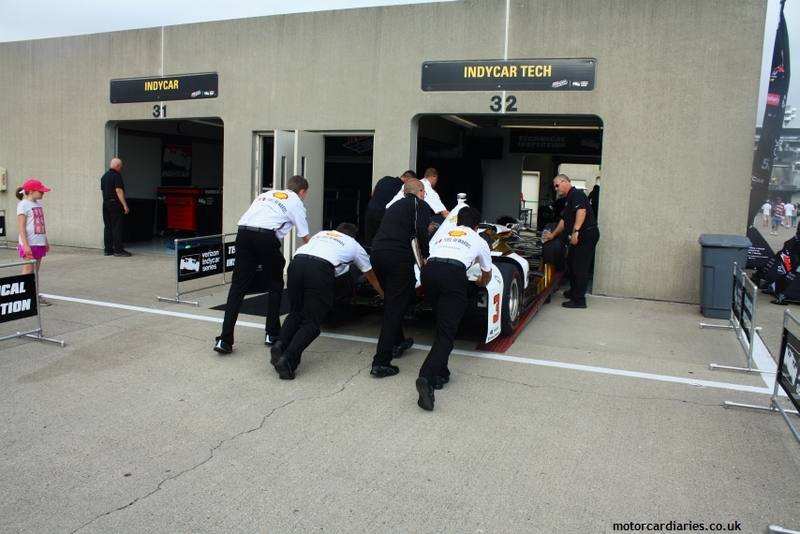 They’re being wheeled between the inspection bay and their own garages on dollies, with delicate front wings mounted high for convenience. 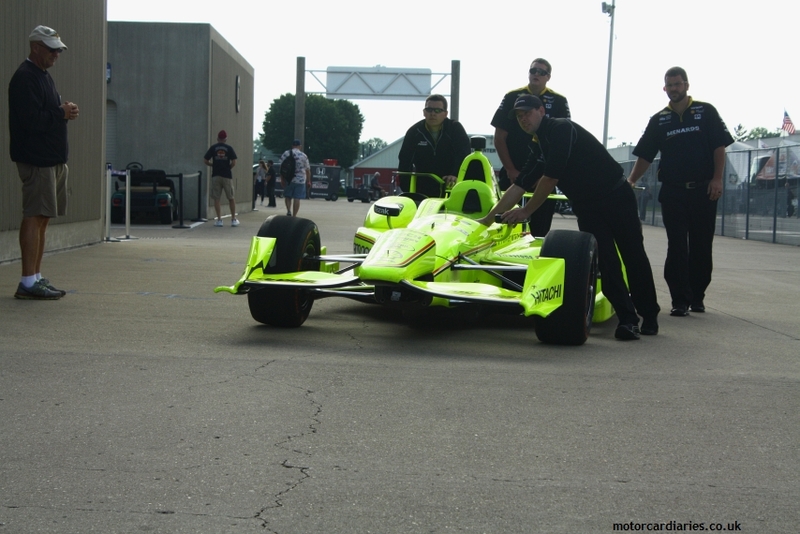 As we potter between the various teams, Simon Pagenaud’s lurid yellow Penske appears in front of us. 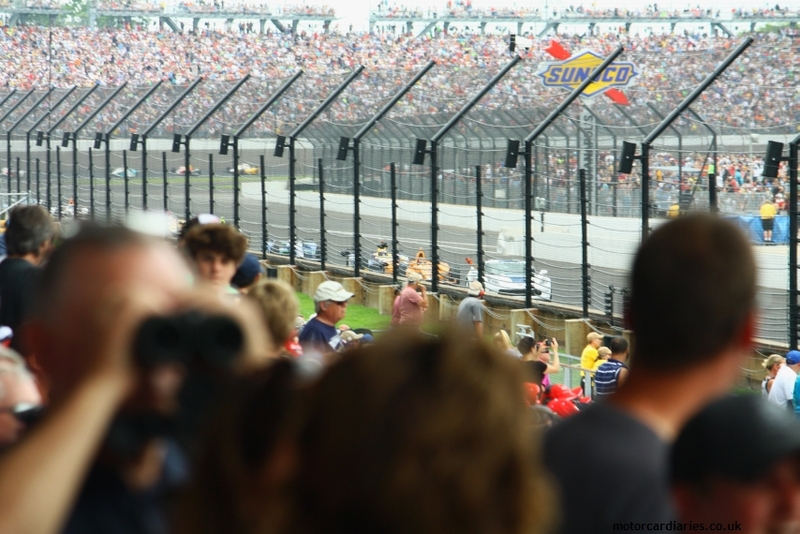 Already feeling emotionally charged from the enormity of being at the Speedway – a place I’ve yearned to visit for 25 years – the sight and proximity of a Penske is enough to have me welling up. 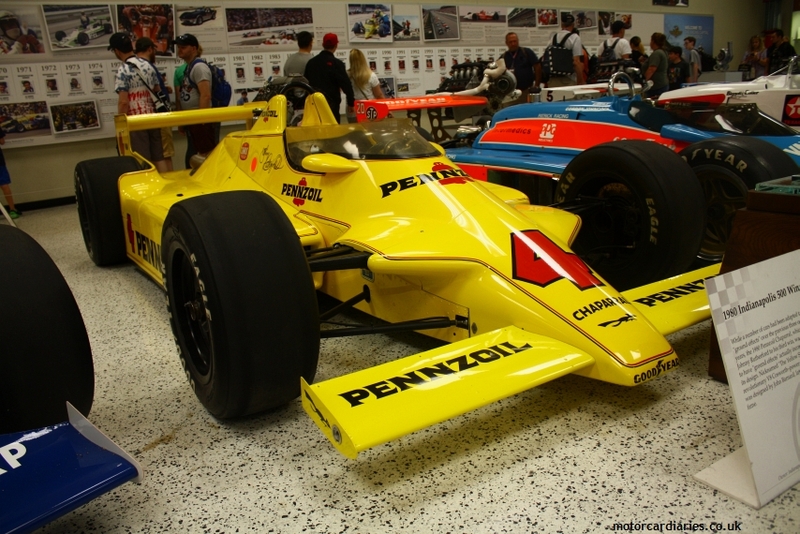 This is absolutely one of the defining moments of my racing life: Penske at Indy is like Ferrari at Monza or Porsche at Le Mans. 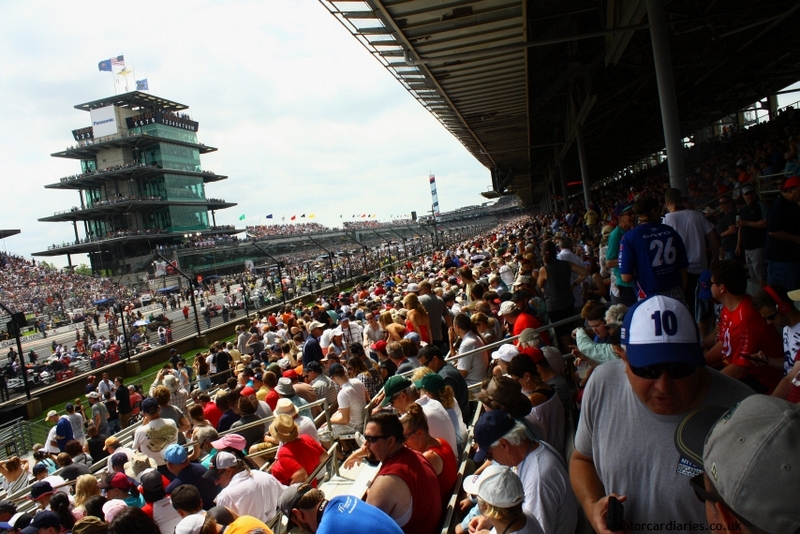 There’s an alchemy about the Speedway and a magic in the air that defies explanation and rational thought. It’s very, very special and an apparently innocuous moment has reduced a grown man to tears. 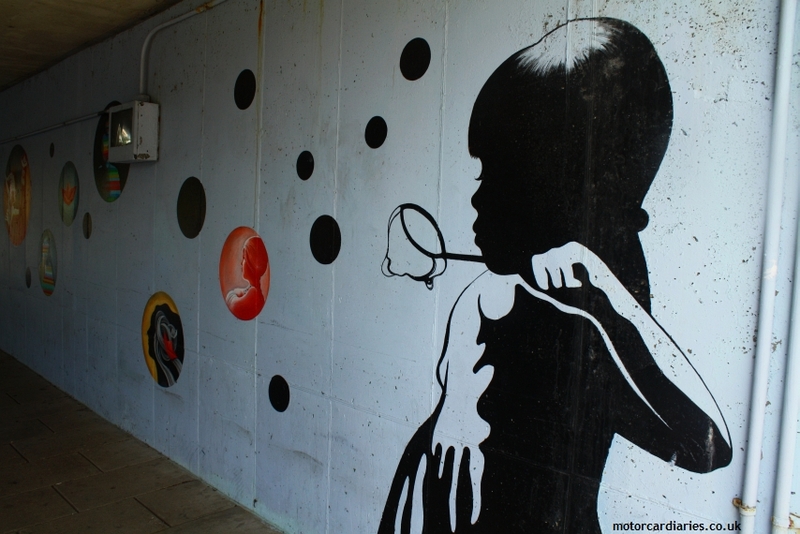 Having made some effort to recompose myself, we continue to explore. 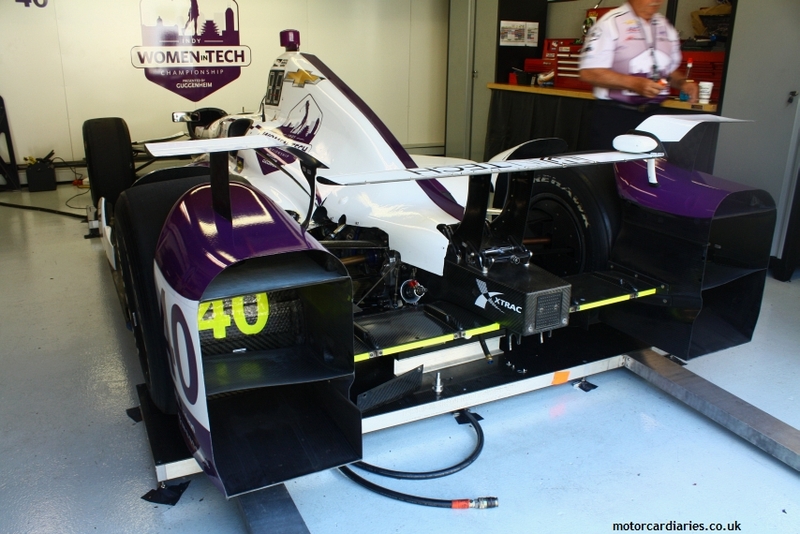 Scrutineering is known as ‘tech inspection’ in these parts and it’s entirely visible to the punter – akin to Le Mans. Everything happens in public and the cars are out in the open queuing up to be inspected. In fact, if one were so inclined, it would be perfectly plausible to hop into the cockpit of one of the cars, such is the easy-going nature of the access here. It’s a real pleasure just to mooch around and soak up the atmosphere, permitting oneself a little giddiness at the reality of the whole affair. And it’s not raining! Yet. 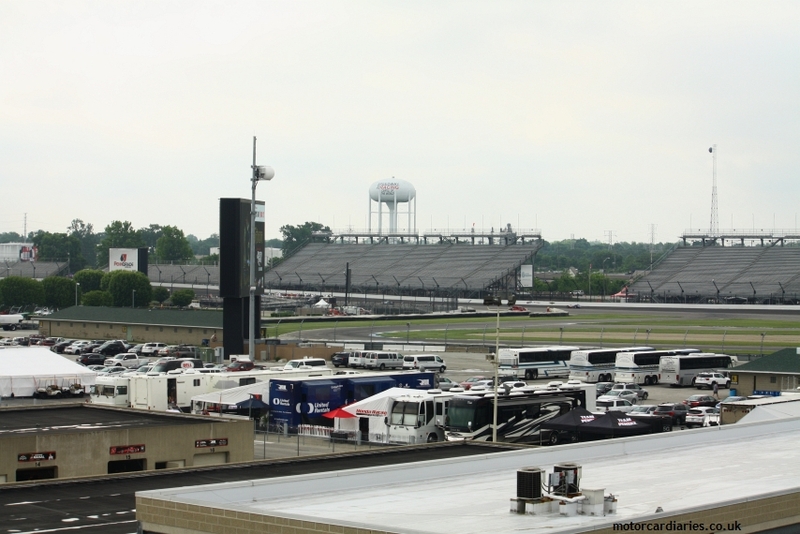 Track action is relatively limited and the 500 field itself isn’t running today. 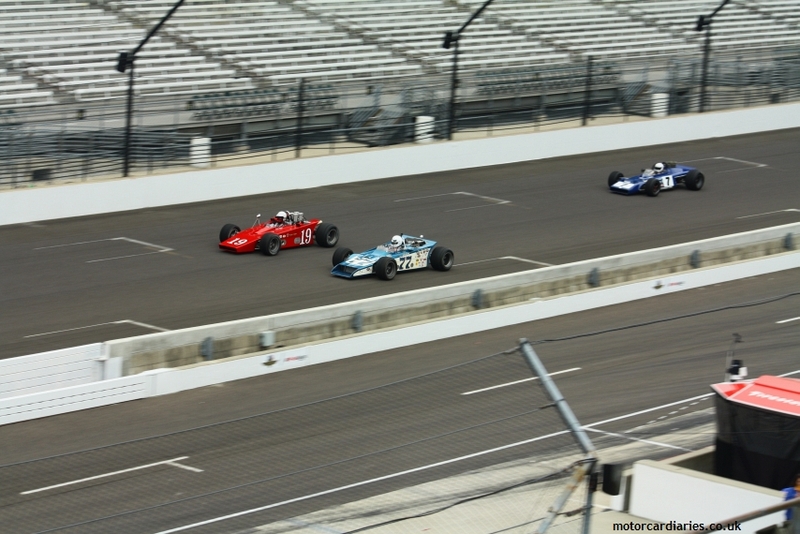 However, there are three groups of historic IndyCars doing high speed demonstration laps and they’re hugely evocative in their own right. While notionally behind a pace car, they’re still travelling pretty quickly and we adopt a perch on the infield ahead of turn one. The fields showcase everything from spindly 1920s racers through to chunky 1980s turbo cars, with everything in between represented. The fabulous ‘roadsters’ of the late-1950s and early-1960s are particularly fascinating and, for this European, hugely redolent of the era. 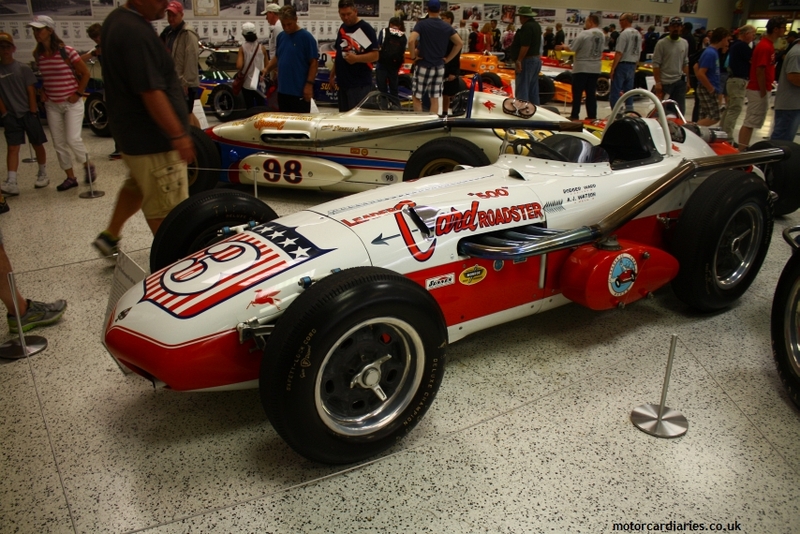 While front-engined open wheel racers effectively died out with the 1.5l GP formula of 1961 in Europe, these brutes continued to enjoy success for several more seasons Stateside. 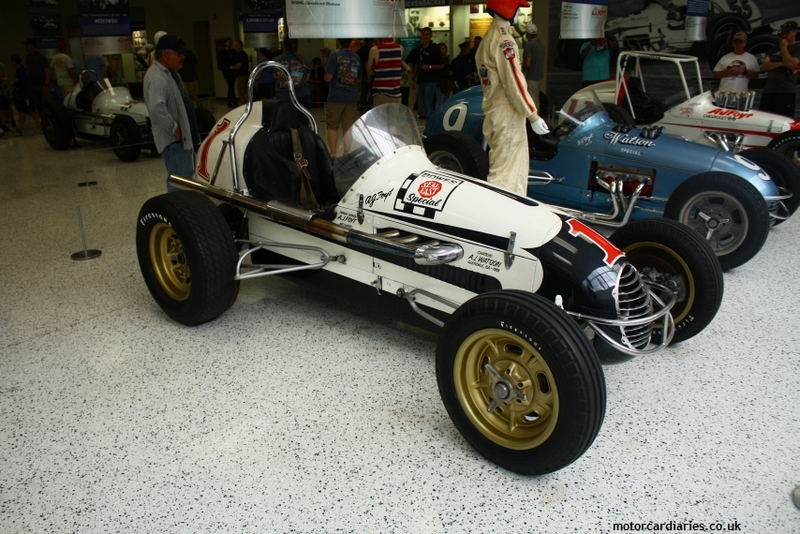 AJ Foyt was carried to victory at the Brickyard in a roadster as late as 1964. 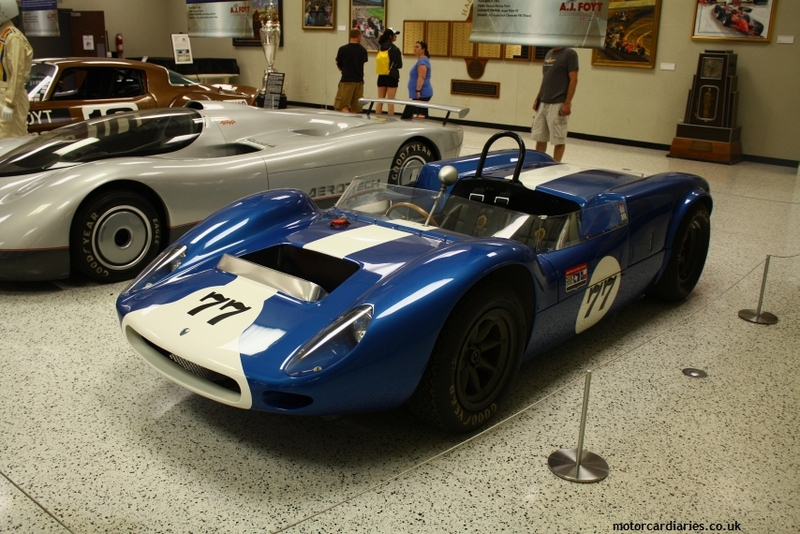 The ultimate iterations of these behemoths might be cited as the last purpose-built cars of their type. 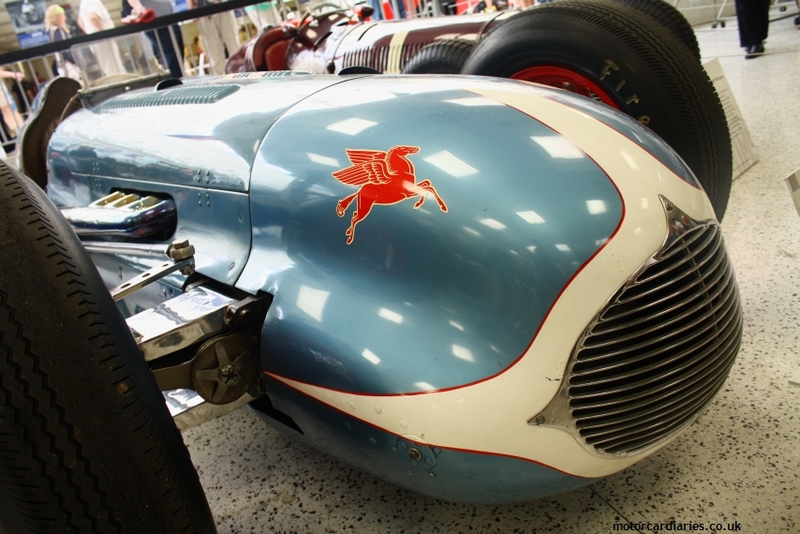 With laydown engines and booming Offenhauser four cylinder engines, they are thrilling to observe running together in small packs. 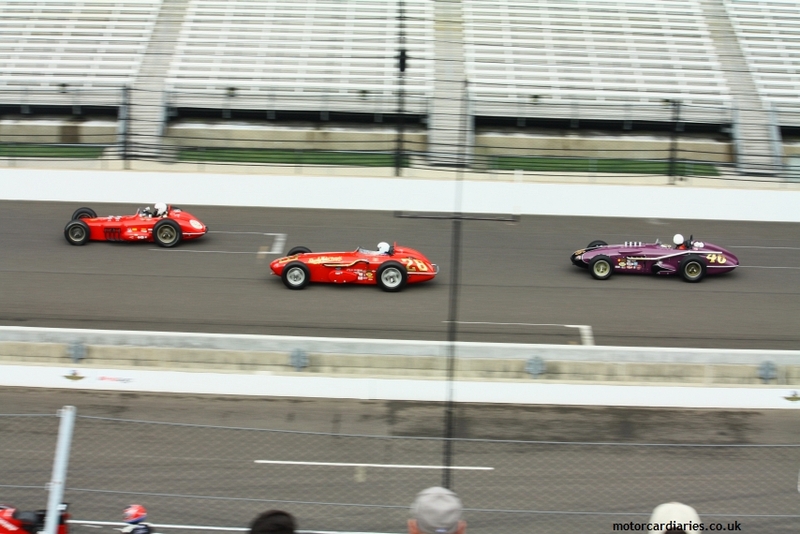 One can only imagine the terror of 33 of these monsters barrelling into turn one during the early-1960s when average lap speeds were nudging 150mph in qualifying trim. 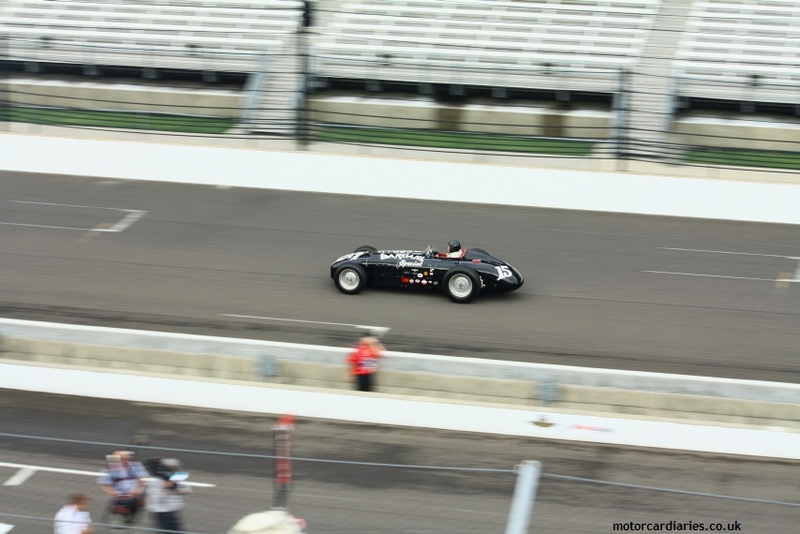 While the blood and thunder of the Offy roadsters stirs the soul, equally intriguing is the quietest car in action: one of the quartet of Lotus Type 56 turbine wedges is whistling around the Speedway at pace. 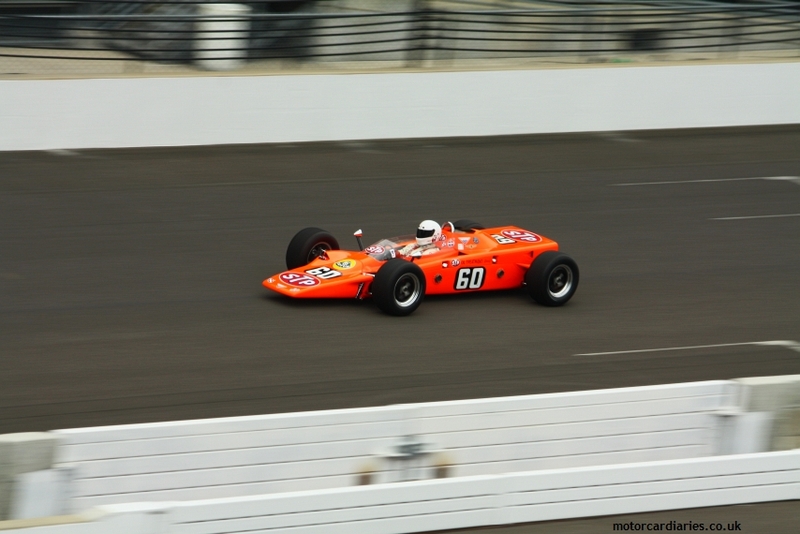 Heralding a new era of aerodynamics, the vivid orange ‘carrot’ sought Indy glory using a Pratt & Whitney helicopter-type gas turbine engine. 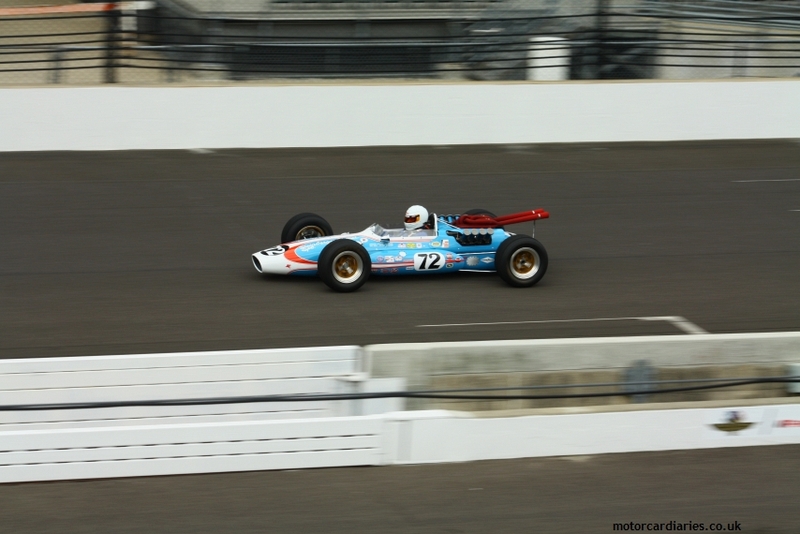 Joe Leonard claimed pole and led the 1968 Indy 500 before retiring just a handful of laps from the end of the race in one of those great ‘could have been’ moments in motor sporting history. The sight of the Type 56 and its incongruously silent progress remains a Legends Day highlight. 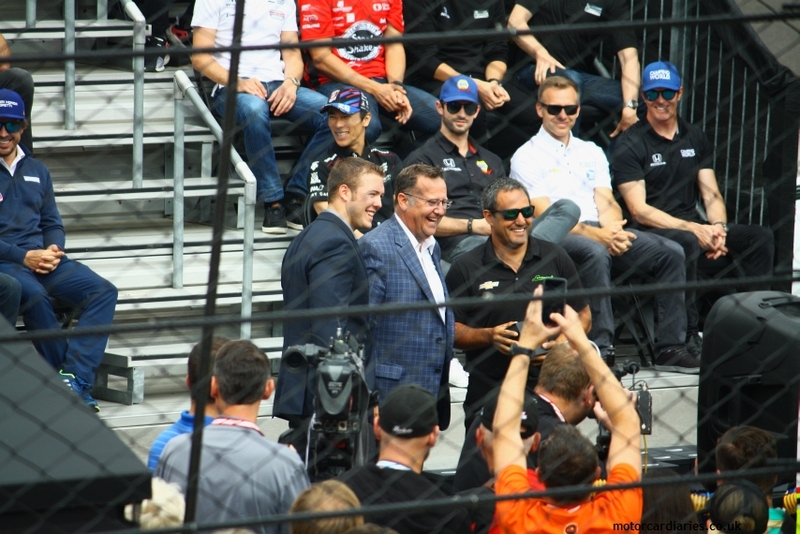 Closing out the demonstrations are Johnny Rutherford and Mario Andretti. 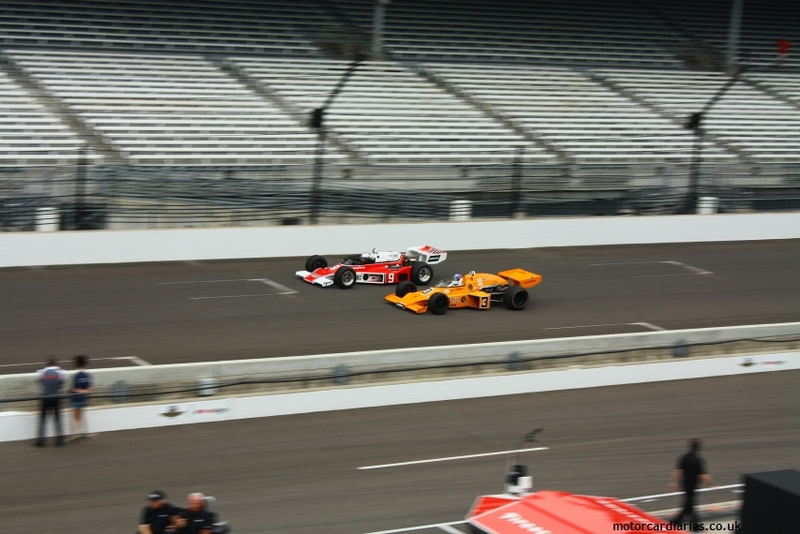 In tribute to McLaren’s much-vaunted return to the Brickyard with Fernando Alonso, Rutherford turns laps in his 1974 500-winning McLaren M16C/D. 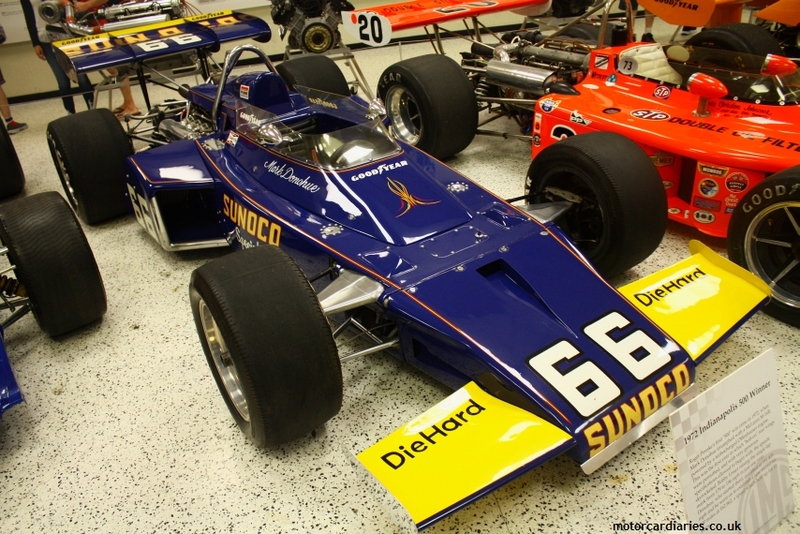 Alongside is Mario Andretti in a later M24 – the car he raced for Penske at Indy in 1977. 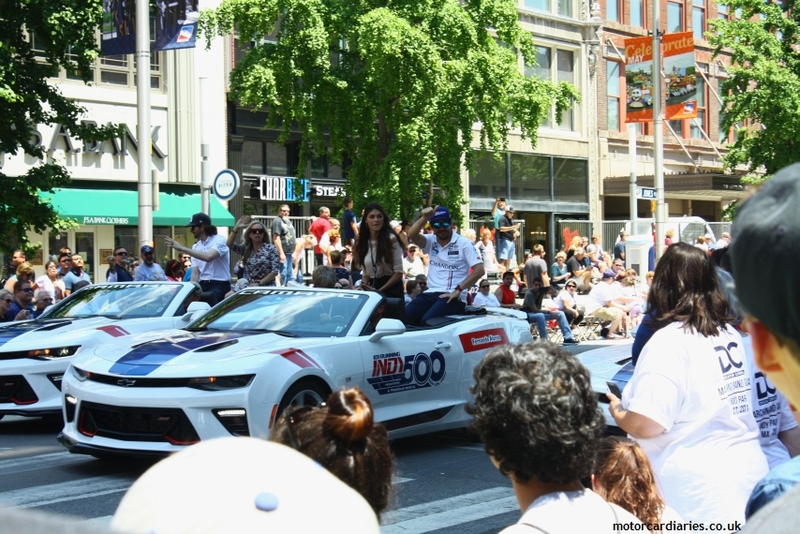 This is an event which pays due reverence to its heroes of the past while still acknowledging that the most important Indianapolis 500 is the next one. The final piece in the Legends Day jigsaw is the driver briefing. Not locked away behind closed doors, this takes place on the front stretch, facing the grandstands and everyone is free to attend. The competitors line up neatly in starting order and it’s fascinating to observe the dynamic between them. Some are obviously pally, while others stare at their phones. 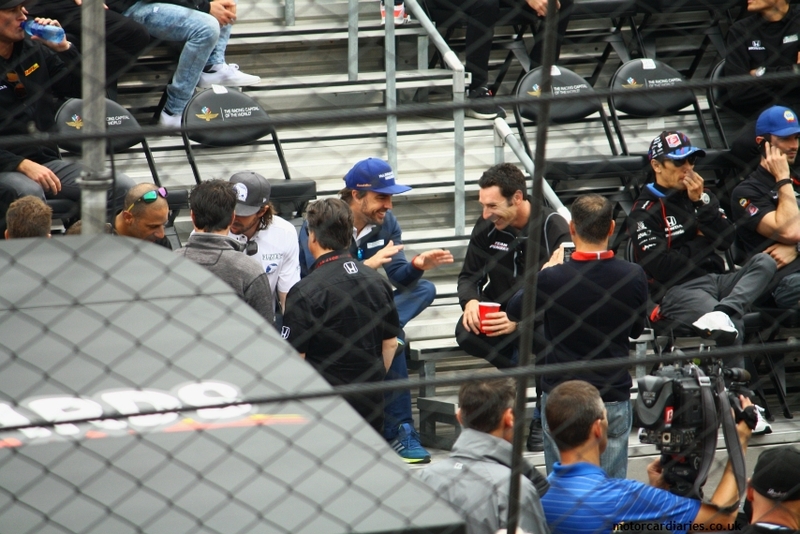 Fernando Alonso carries himself quietly and seems to enjoy interacting with old rival Juan Pablo Montoya, the pair chatting for several minutes. 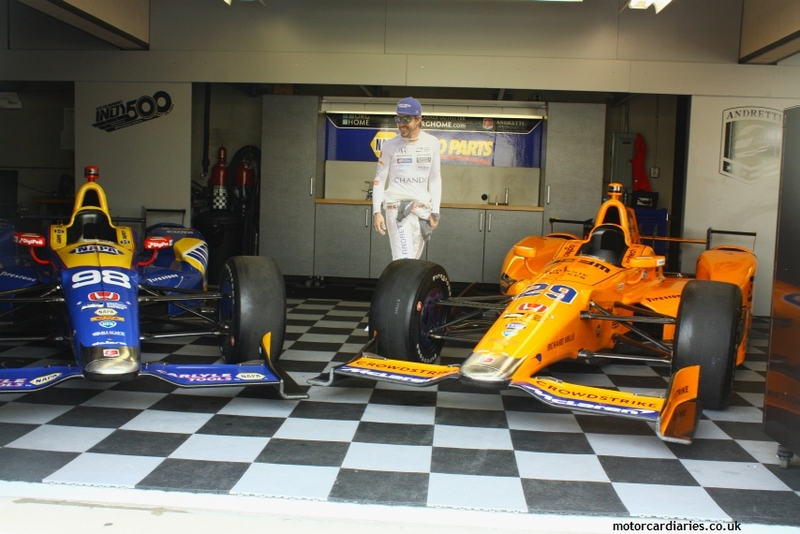 Alonso also dives into a spirited engagement with reigning IndyCar champ Simon Pagenaud, the duo illustrating their words with that enduring racer’s dynamic explanation, the outstretched hand. The briefing does contain some element of, “don’t crash into each other and obey the flags” but it’s mostly pageantry. 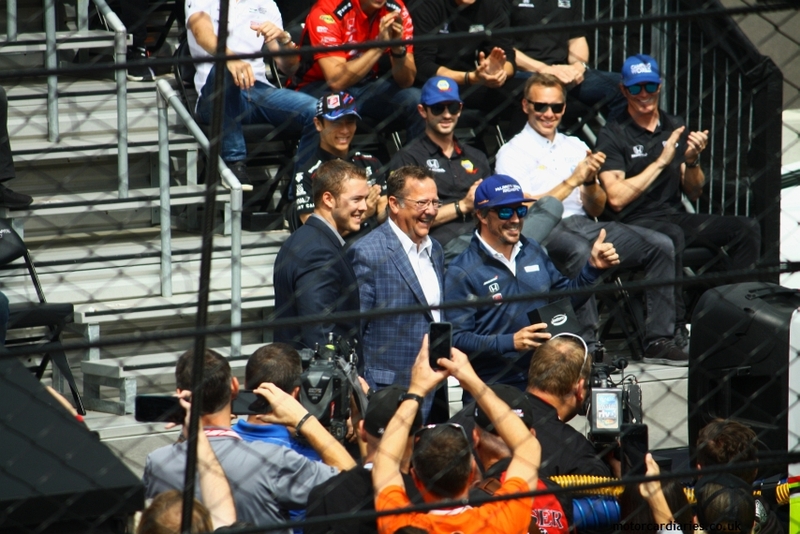 Each runner is presented with a participant’s ring by somebody terribly important, whose identity escapes me, while 2016 victor Alexander Rossi is awarded a miniature Borg Warner trophy and delivers a short impromptu speech. 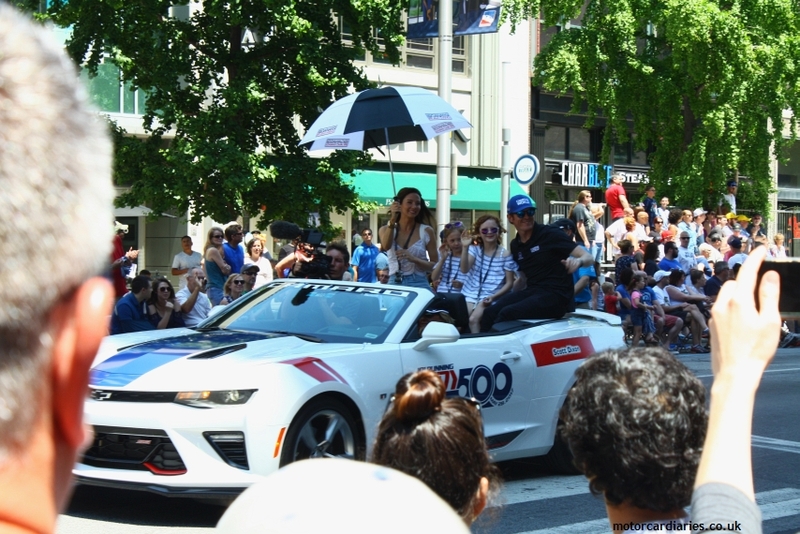 He receives a warm reception and his success, along with that of compatriot Joseph Newgarden will be critical for IndyCar to regain any kind of foothold in the mainstream domestic conscience moving forwards. 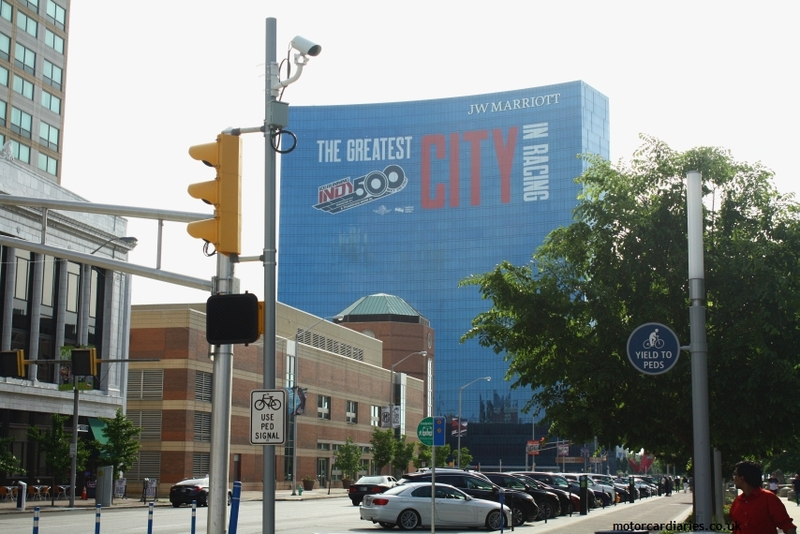 Indy is also particularly good at looking after its long-standing visitors. 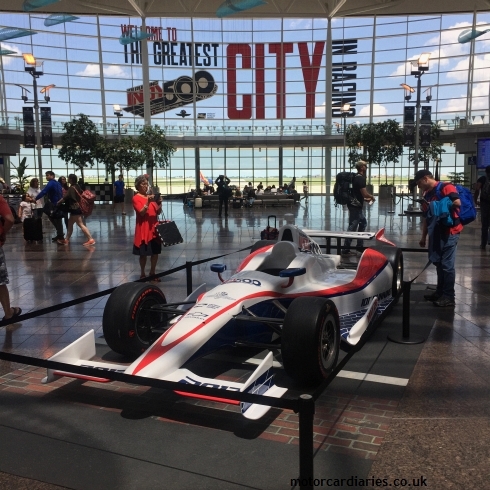 One old boy, who has been attending the 500 since Adam was a lad rises to his feet from the spectator stands and delivers his view on contemporary IndyCar racing. I was staggered to learn that Speedway president Doug Boles calls ten loyal Speedway customers every single evening on his commute home – just to tell them how much he values their custom. It underlines how seriously traditions and the dynastic element of racing are embedded in this part of the world. It’s interesting to note, as we file away from the briefing, that the pit garages erected for Formula One compliance are now redundant. 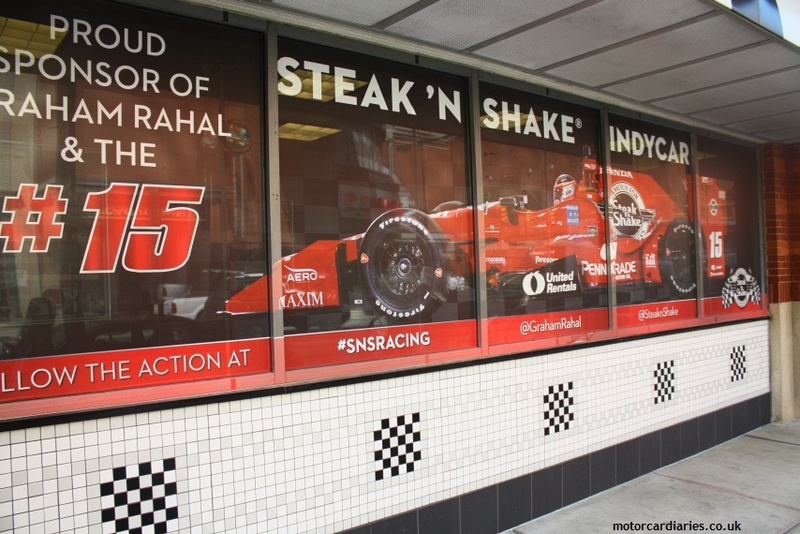 Rather than filled with expensive racing machinery, they are replete with merchandise stalls selling everything you can possible imagine with an Indianapolis logo emblazoned somewhere and somehow. I purposefully hold off purchasing anything on Saturday – I feel it may yet jinx us. Imagine buying a t-shirt for an event which we miss due to rain. 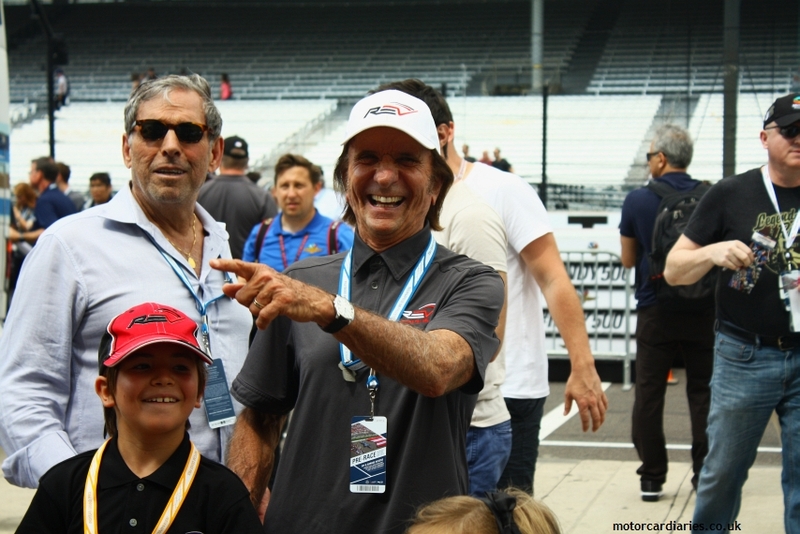 While ambling the pit lane we bump – almost very literally – into Brazilian legend Emerson Fittipaldi. 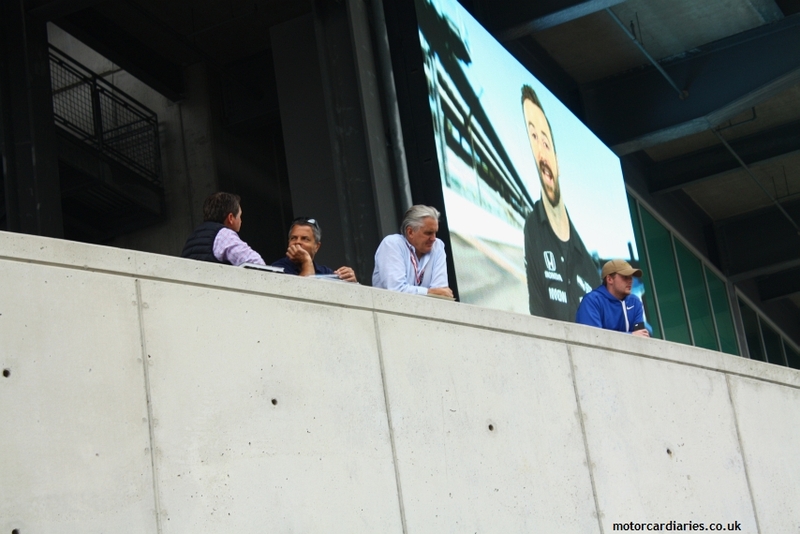 His craggy features may have aged since the days when his luxurious sideburns defined the F1 paddock but his smile remains undimmed and there’s a magical moment when he stares straight into my camera lens wearing a grin a mile wide. I’ll treasure that one. 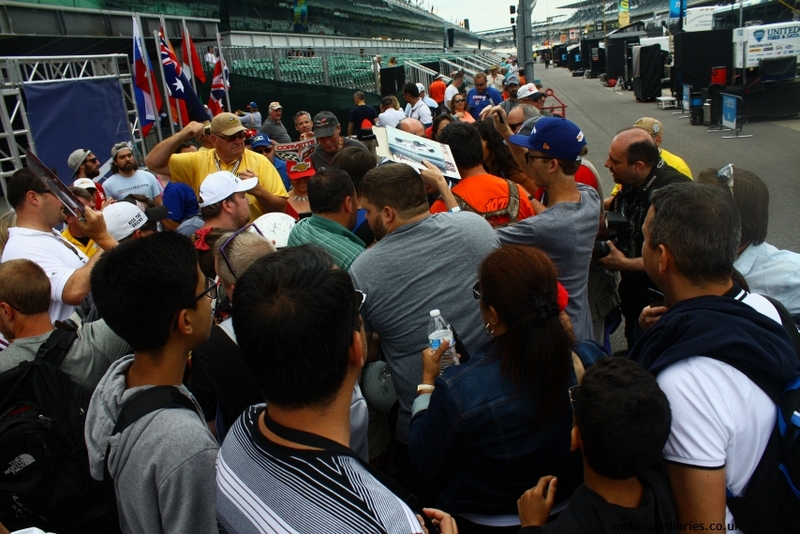 Almost immediately he’s lost to a scrum of autograph hunters and well-wishers. 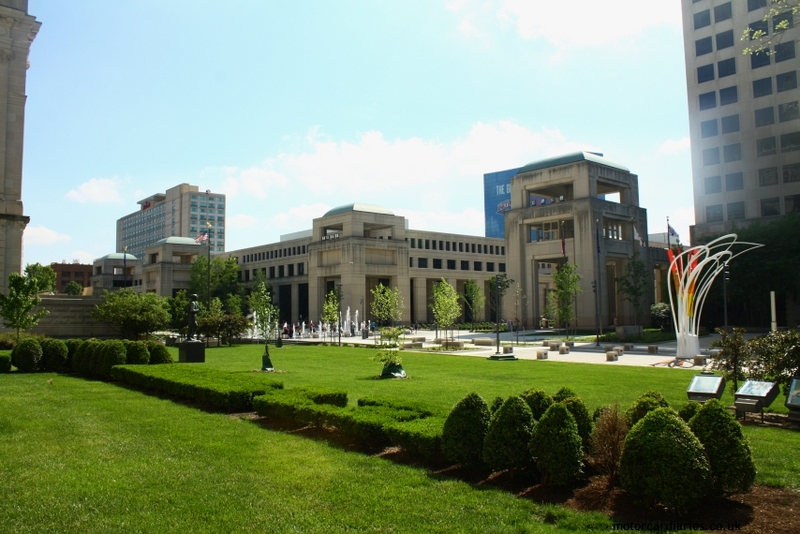 Being an Indy legend looks like hard work. 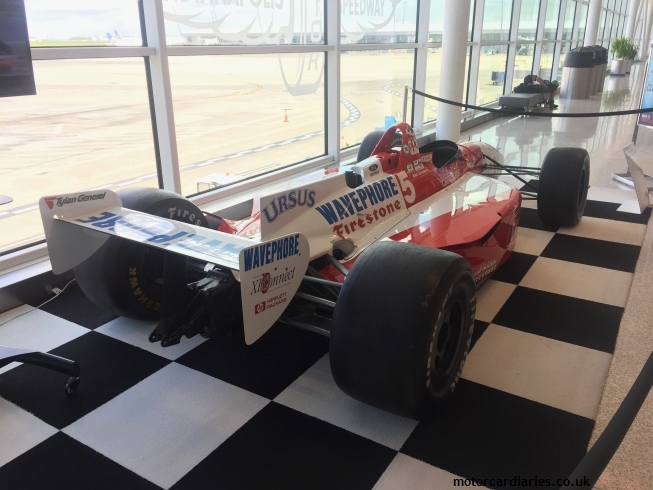 We close the day by jumping up into the ‘stands to watch Mario Andretti turn a few spirited laps aboard the IndyCar two seater. He’s a guy who will never stop driving quickly and amen to that. 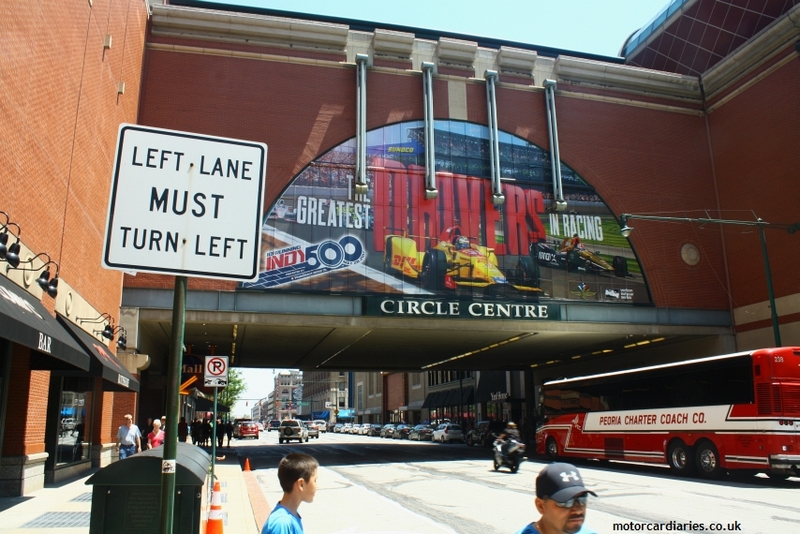 Once back downtown (the circuit is actually in Speedway, about half an hour from our hotel), we track down the parade which takes place over several closed roads in the CBD. This is pure, wonderful American pageantry. Marching bands play, girls twirl star-spangled banners and inflatables the size of Yorkshire terrace houses bounce incongruously along the boulevards. 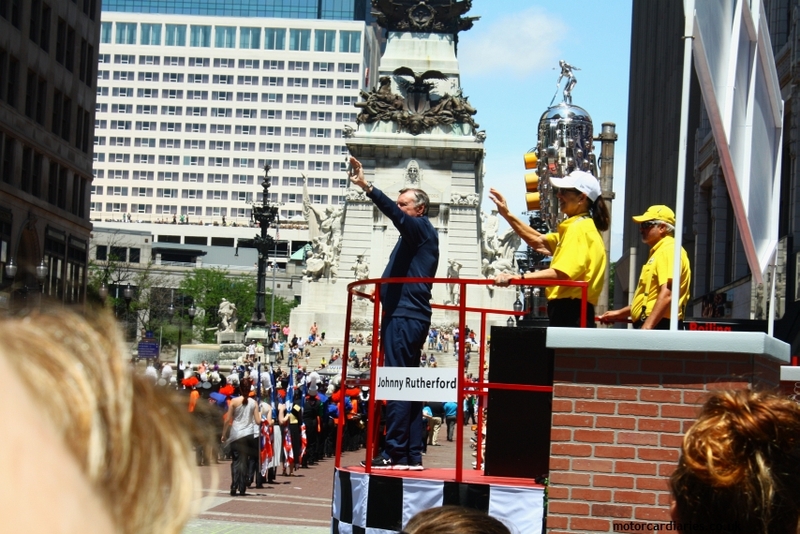 Among all the floats and rattling snare drums is Johnny Rutherford, standing proudly next to the Borg Warner trophy. 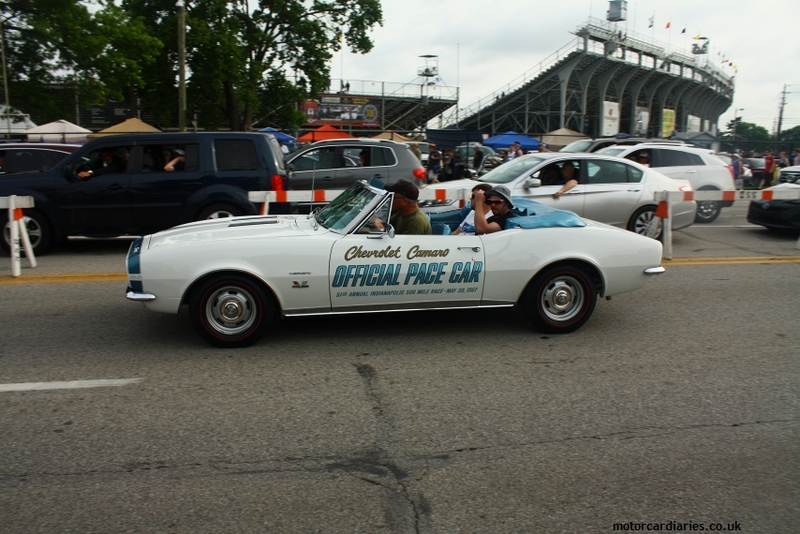 All 33 2017 race entrants and their families are toured through the streets in open-topped Camaros. Naturally we give our man Fernando a rousing cheer. Not being terribly familiar with this kind of event, it reminds me of Ferris Bueller’s escapades in Chicago. Race day is busy. Actually, it’s really very busy indeed but what do you expect when 250,000 race fans descent on one spot; albeit a vast one? Our coach has a police motorcycle rider guiding it in and it’s a blessing though we still queue plenty. 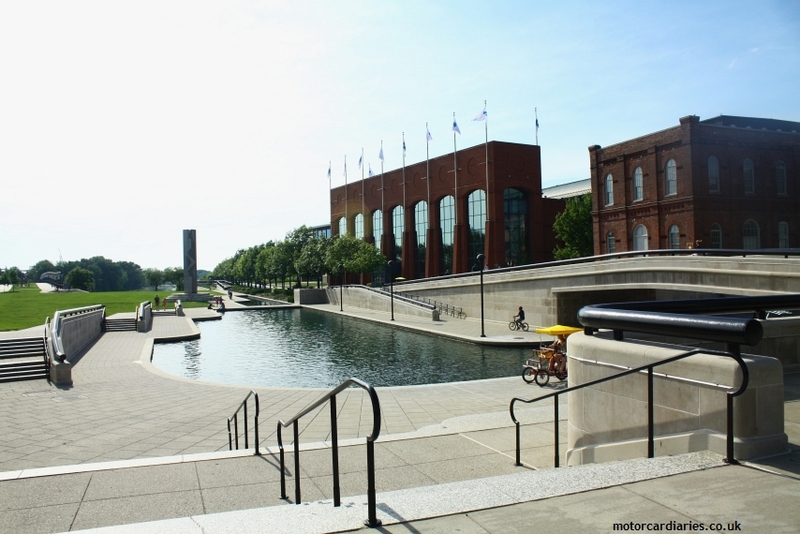 With bags inspected, we make our way straight to the museum. We had debated visiting on Legends Day but decided it would have been too much of a rush to really enjoy. 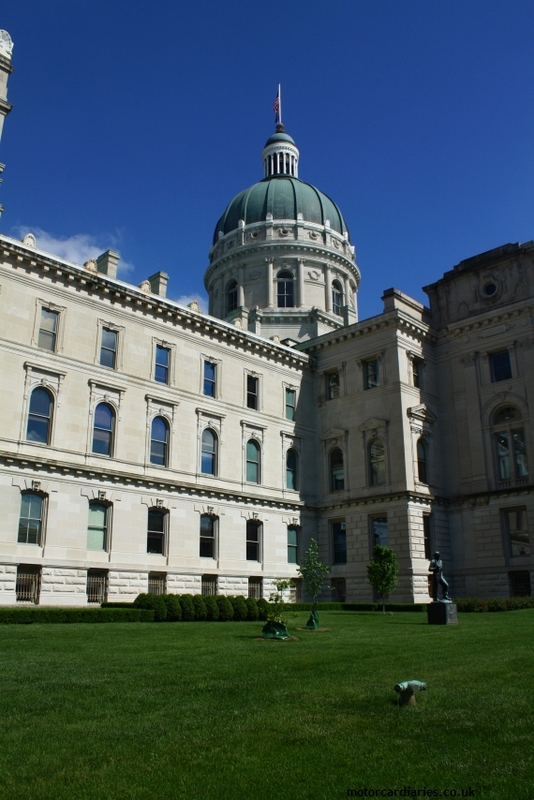 The building itself is relatively understated but the collection lurking therein is truly remarkable. 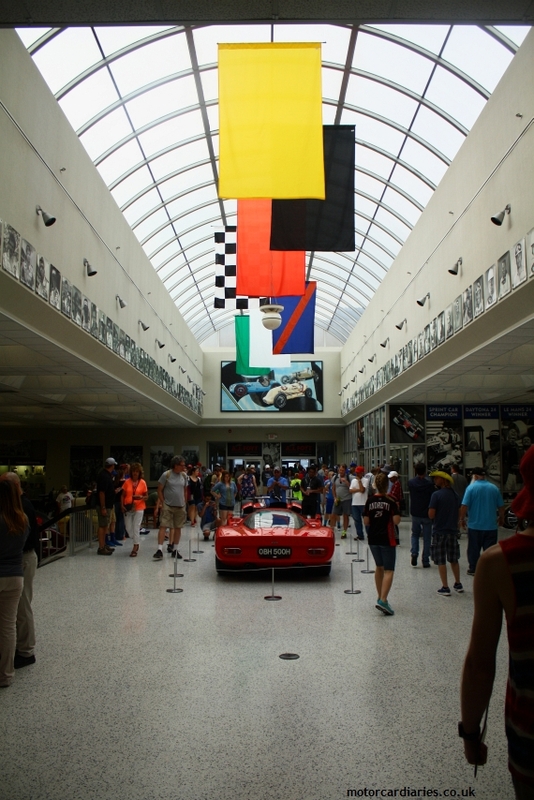 The main hall features a huge selection of past Indy 500 winners. 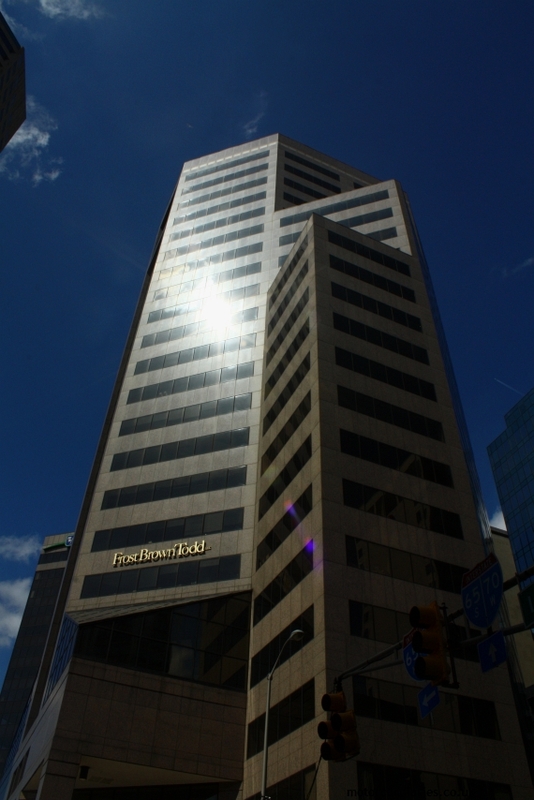 It’s something of a shock – the outright victors just keep coming. I reckon there must be 30; maybe more. 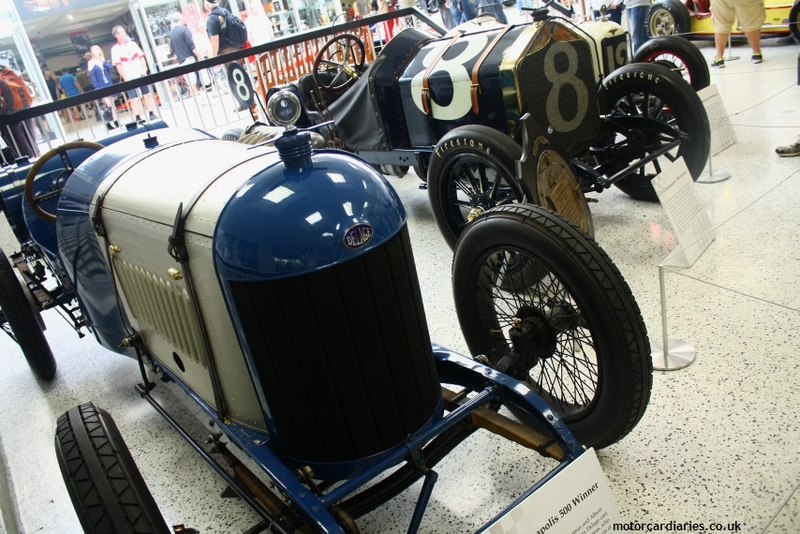 These span every era from Ray Harroun’s Marmon Wasp which won the inaugural 500 in 1911 through to Alexander Rossi’s 2016 fuel-sipping Dallara. 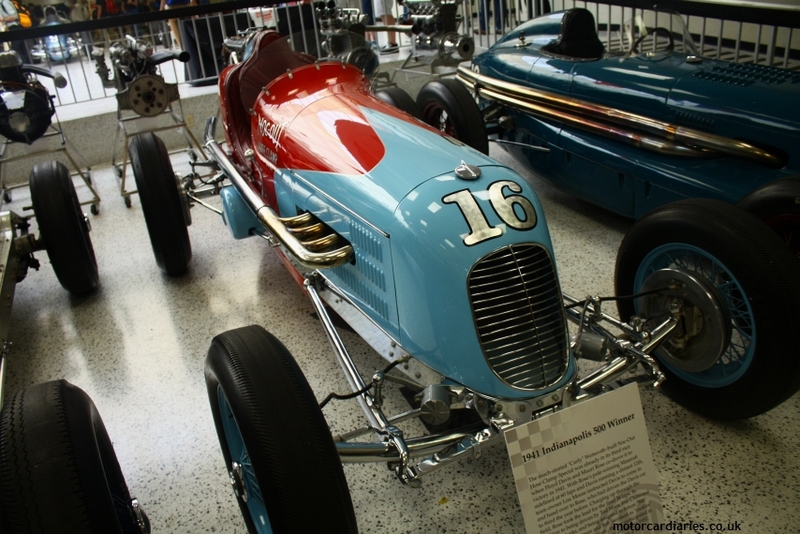 The highlights are plentiful, with many of my absolute favourite IndyCars on display: Wilbur Shaw’s brutal Maserati 8CTF which won in both 1939 and 1940; both lurid Johnny Lightning Specials which carried Al Unser to consecutive wins; Mark Donohue’s 1972 McLaren which provided Penske’s first laurels at the Brickyard; and the coolest of them all – Johnny Rutherford’s Chaparral 2K, the very yellow, ground-breaking, ground-effect challenger which triumphed in 1980. Much like the Donington Collection or the Schlumpf in Mulhouse, the sheer volume of important cars is quite overwhelming. 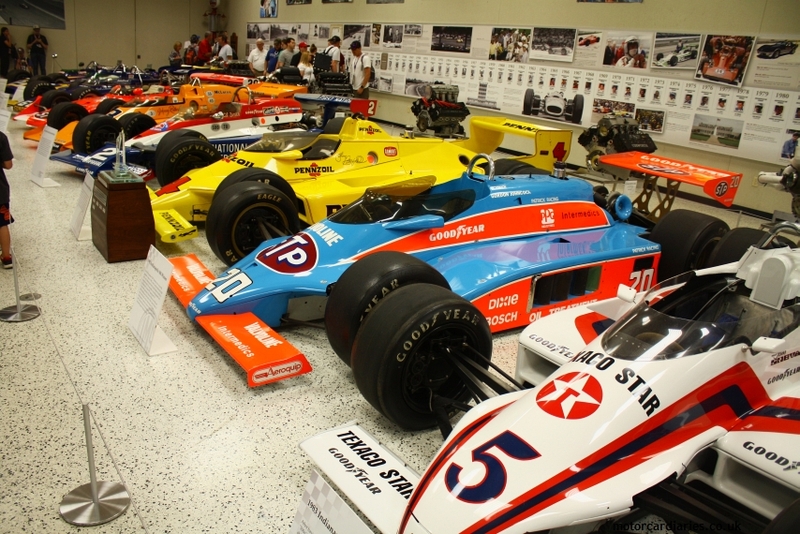 Also of considerable interest is a temporary exhibition dedicated to AJ Foyt. 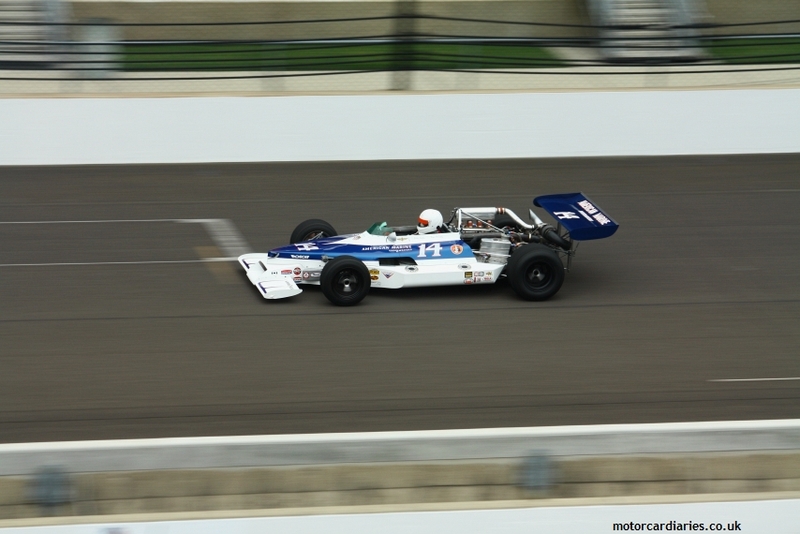 With Foyt having raced so rarely on ‘our’ side of the pond, it’s easy, as a European, to underestimate his importance and achievements in his homeland. 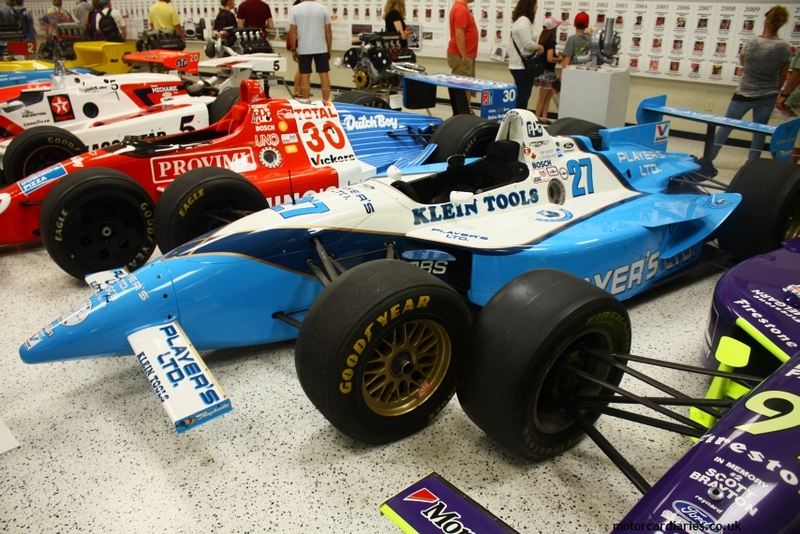 The exhibition showcases all aspects of his career: from midgets through to IMSA GTP weaponry. 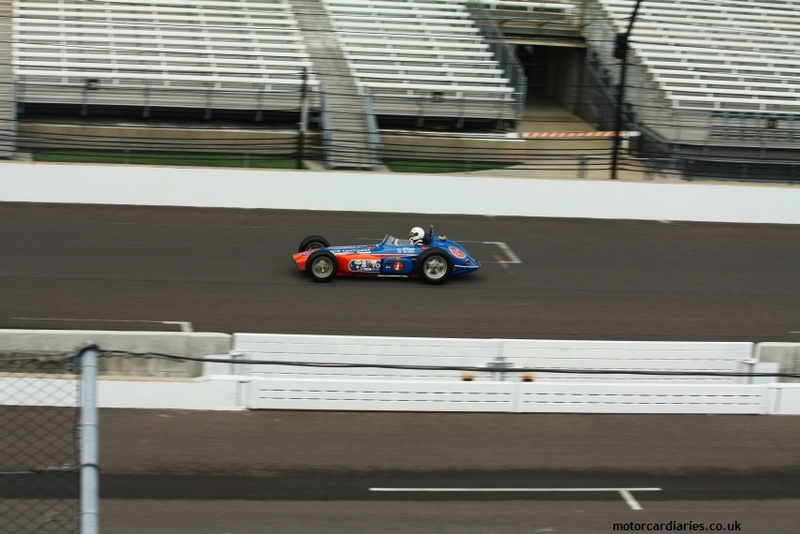 Many of the cars turn demonstration laps of the Speedway later in the morning. 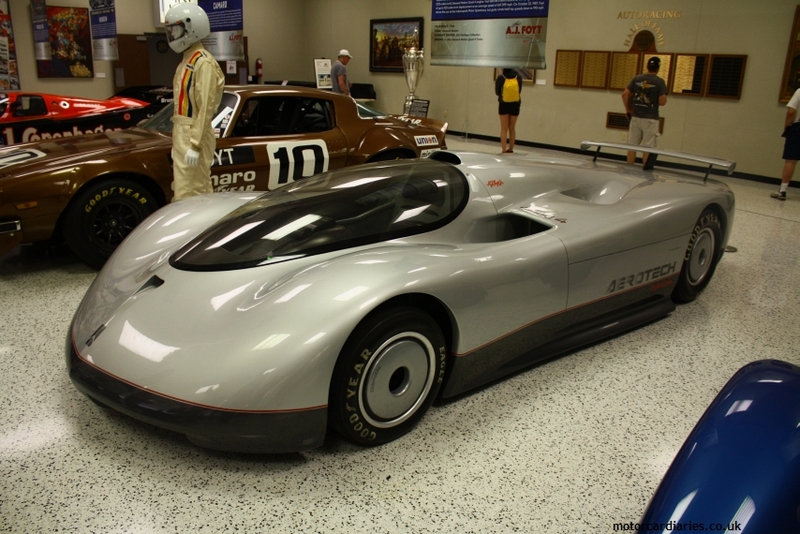 Perhaps the most unusual and diverting vehicle among the displays is the Oldsmobile Aerotech. 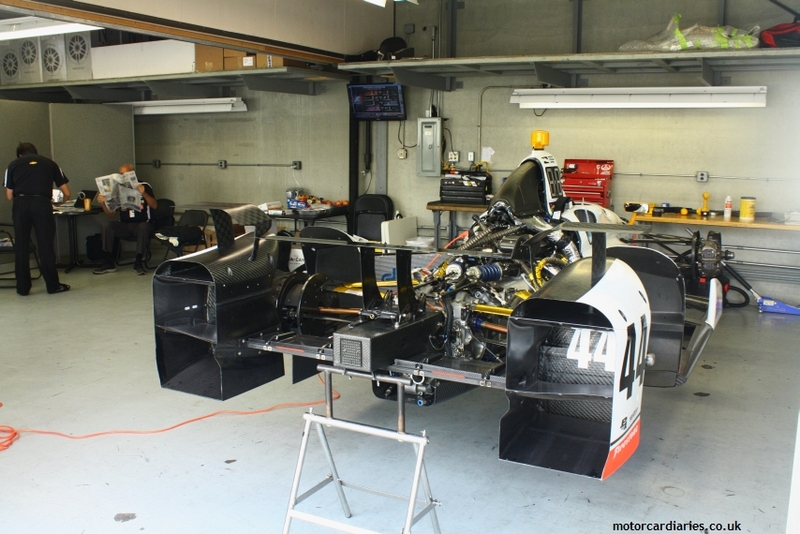 This futuristic-looking machine is essentially a March IndyCar fully enclosed in an aerodynamic body, featuring an Oldsmobile engine with the boost cranked to an ungodly level. 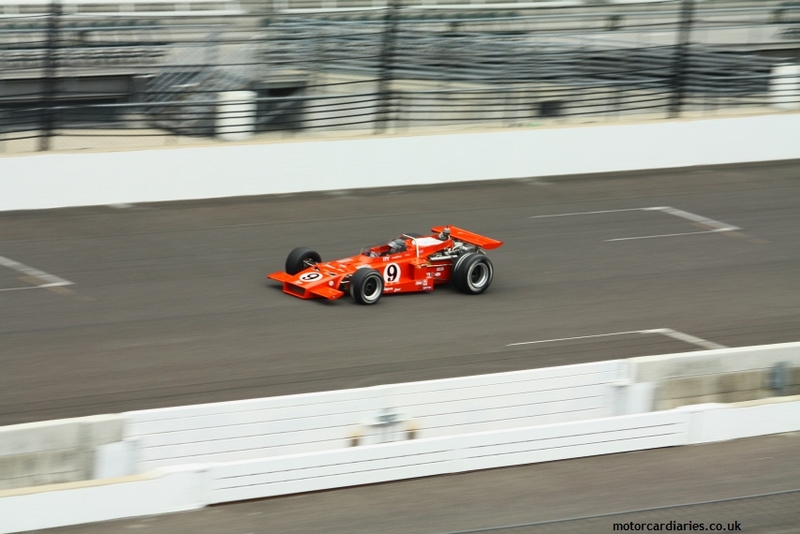 Foyt used the Aerotech to set a scarcely believable closed-course lap record of 257mph. 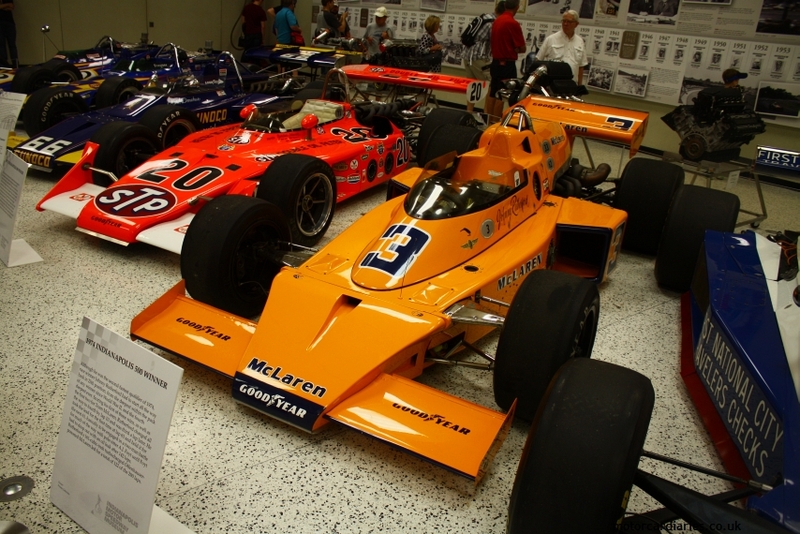 The rest of the museum houses a number of important American open-wheel cars of differing provenance. 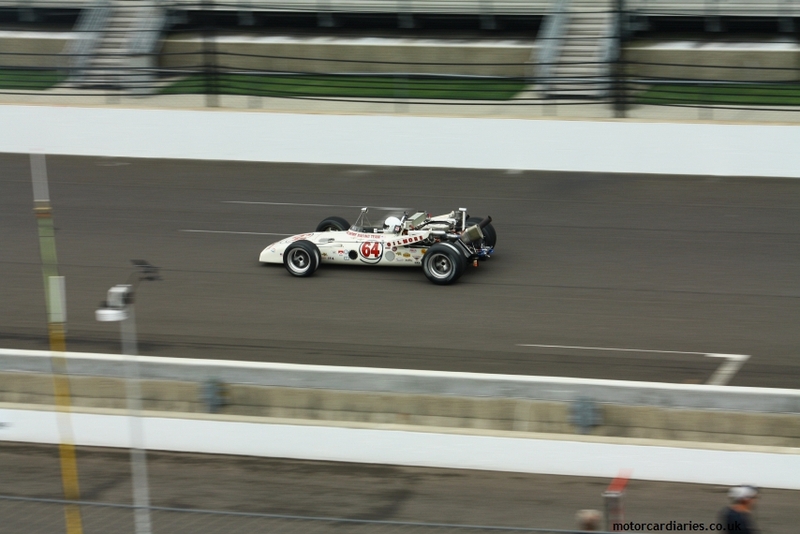 From diesel to gas turbine and front-engined behemoths to slinky modern projectiles, it’s a wonderful reminder of the diversity of the race’s history. 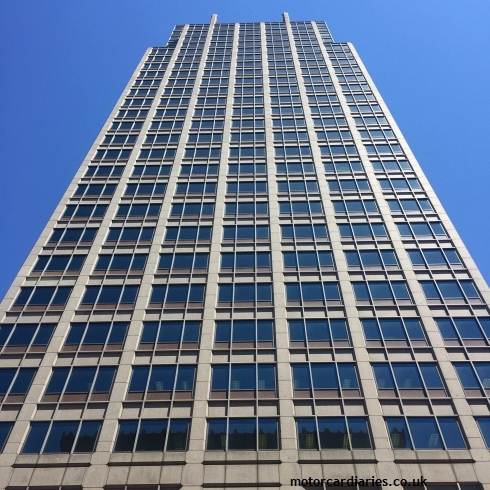 Traditionally, it has encouraged innovation, and risk-taking – technically and on track – is backbone of the race. 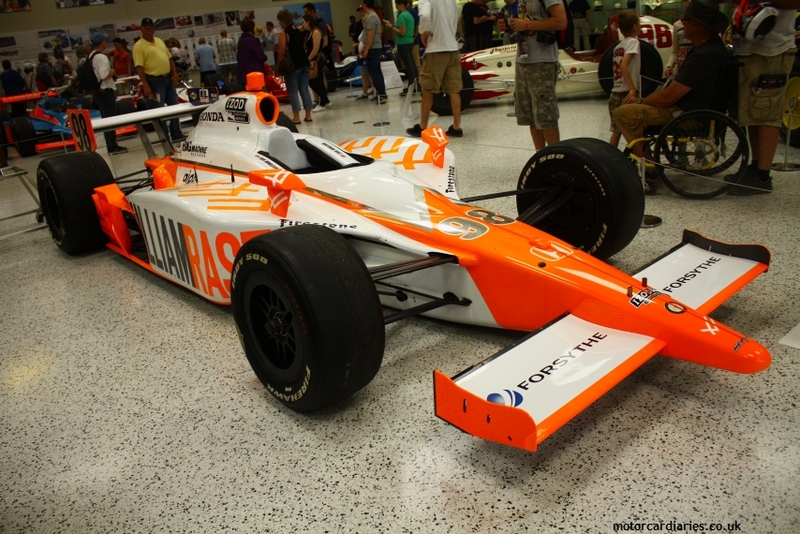 It’s sad to think the future of the race and, by extension, the museum is sequence of identical Dallaras. Hopefully the series can return to full health and welcome a disparate and innovative field once more. The morning is passing quickly and I finally feel sufficiently optimistic about the weather that I am ready to purchase a commemorative t-shirt; and it’s much less naff than my recent efforts from Charlotte and Lucas Oils Raceway. We make our way to our seats, ready for the pre-race pageantry to begin. This is, as Mrs Motorcardiaries correctly calls it, “peak America”. I can’t remember, nor could I begin to document, all of the celebratory events that take place. 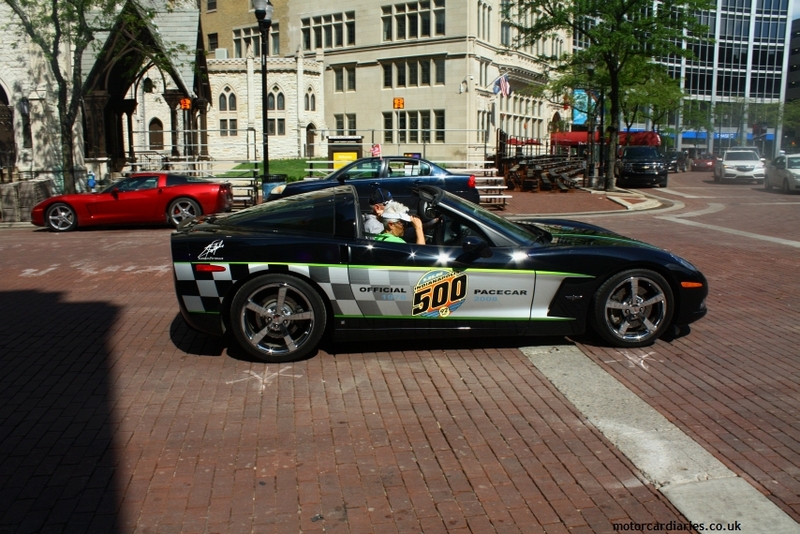 There are more Camaro parades – this time featuring former Indy winners and legends including the likes of Bobby Rahal, Gil de Ferran, Kenny Bräck and Dario Franchitti from my era. 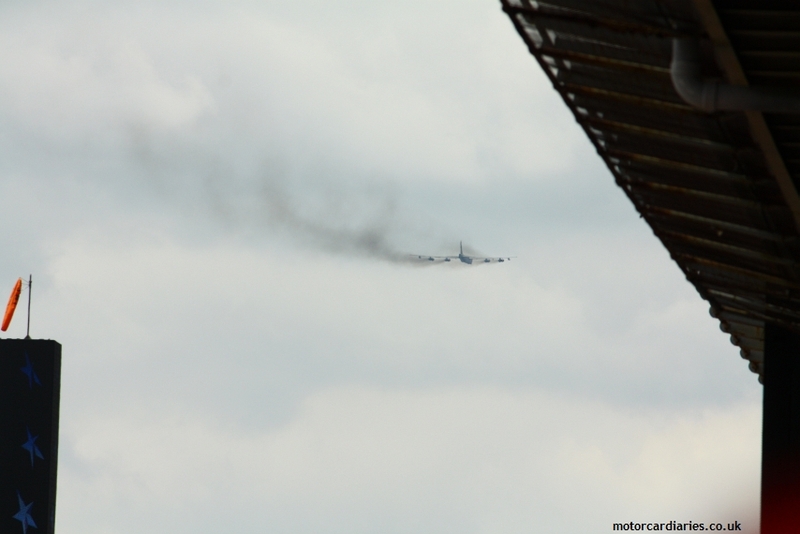 A thundering B52 bomber performs a heavy metal – and very smoky – fly-past. Most unusual is a display from the 101st Airborne Division. Known as ‘The Screaming Eagles’, the 101st is mooted to be the most potent division in the entire US Army so it’s quite an honour to see them in action. 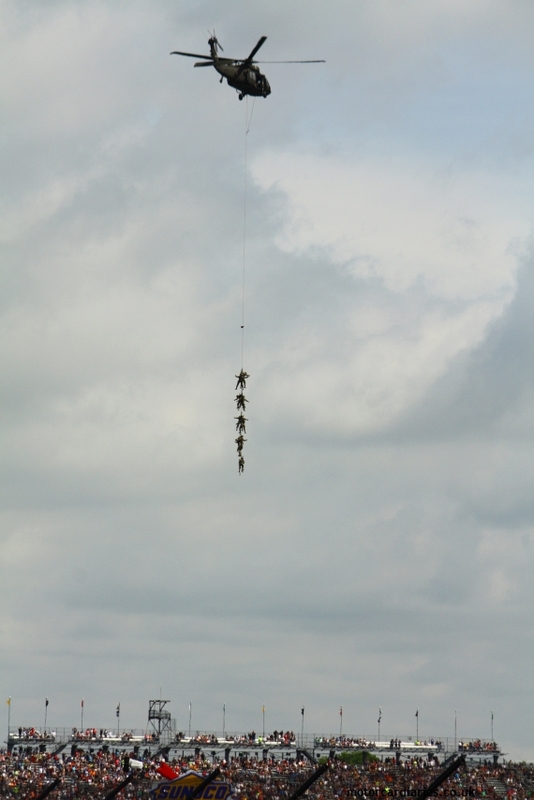 The service personnel clip themselves to a line suspended from a helicopter before being pulled into the sky and flown out of the stadium, suspended 20 metres below the chopper. 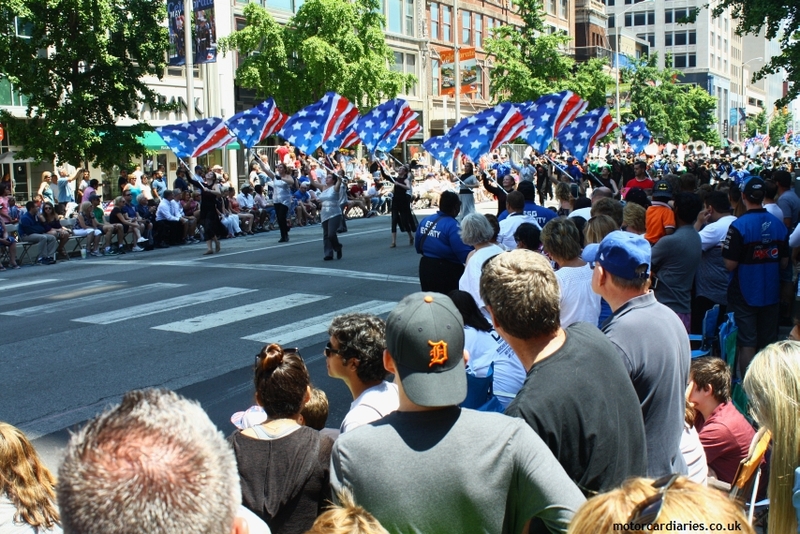 Needless to say, an American flag is unfurled beneath the brave participants. 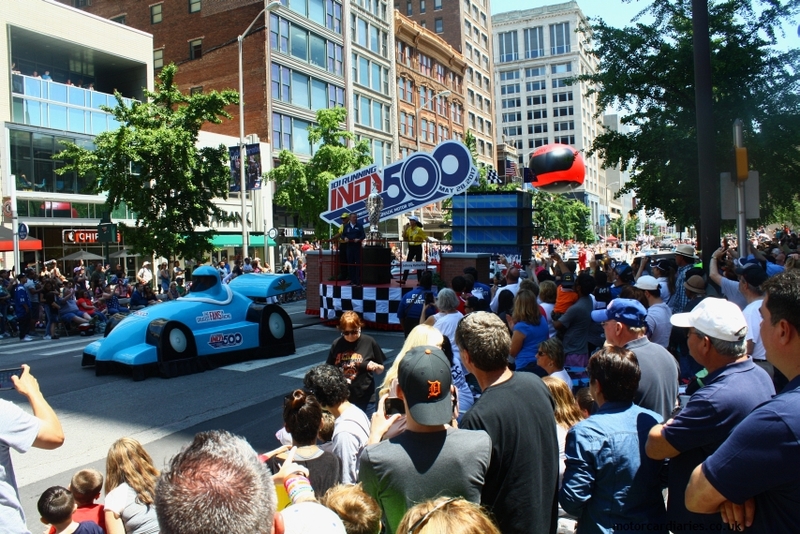 The 500 takes place over memorial weekend – a date of great importance in this part of the world. 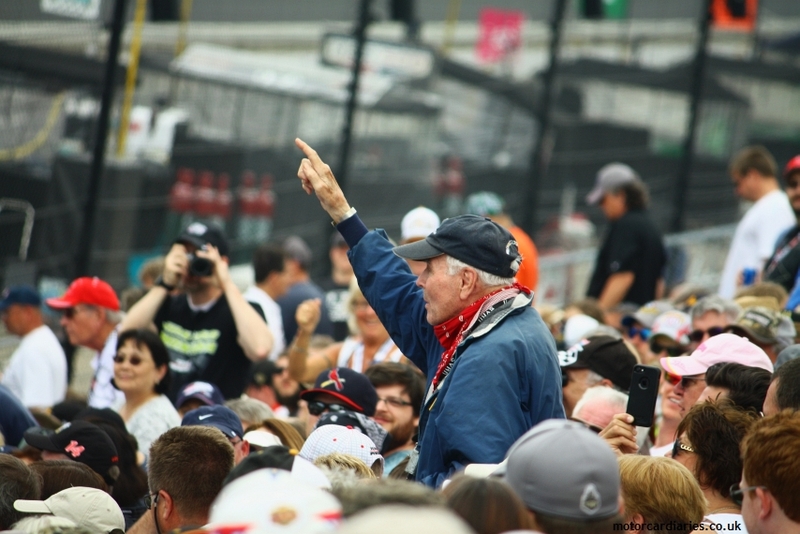 Serving and veteran service personnel are acknowledged and lauded on multiple occasions during the build-up to the race. In fact, such is the depth of sentiment around this particular date, I read one online commentator express dissatisfaction over the nationality of the eventual race winner due to past conflicts between his home nation and the US. It runs deep in these parts. Eventually a pick-up truck sails along the front stretch with the most enormous star spangled banner billowing out behind it: “peak America”. Then we’re ready: “drivers – start your engines!” My body is aquiver with goosebumps and the air is filled with sirens, whoops, hollers and the furious sound of 33 race-ready turbo motors. 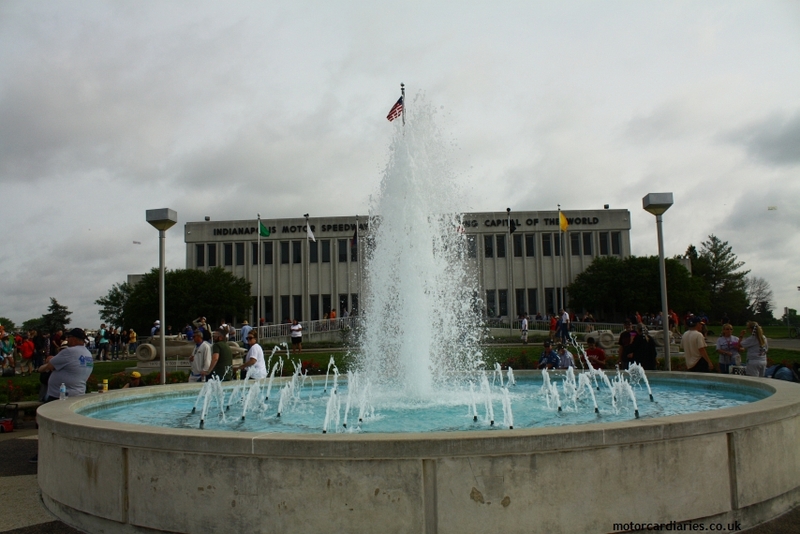 Four tours to get us up to speed and then Scott Dixon will lead the pack across the yard of bricks to launch into life the 101st Indianapolis 500. This is freakin’ awesome. The first full-bore pass is a shock of noise, colour and dense speed; 33 runners through in one stupendous instant. You can scarcely move your head fast enough to track one individual car’s progress. It’s mesmeric. It’s also bloody scary. The speed requires some adjustment, as does the sheer proximity of the cars to one another – and right from the go these guys are at it hammer and tongs. It feels more like a Formula Ford race than the fight for the biggest crown in racing, such is the ferocity and pace of the action. 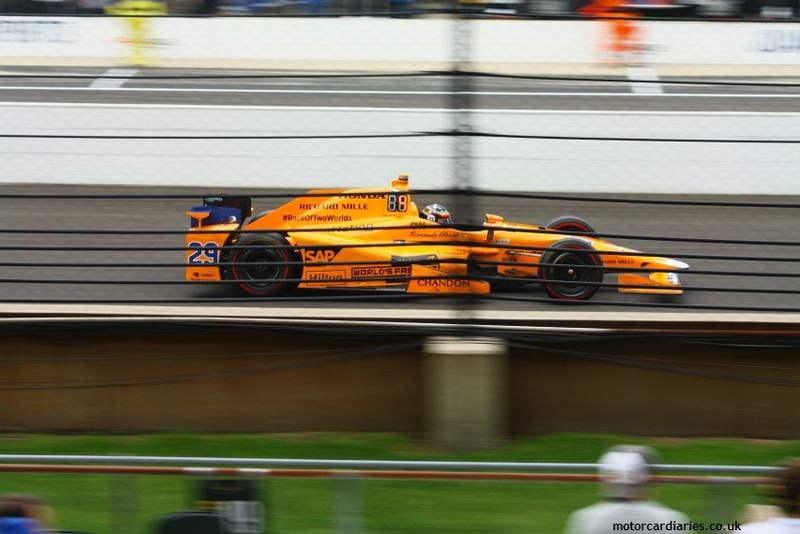 Even heavy with fuel and running in packs, the best are turning in 220mph average laps. 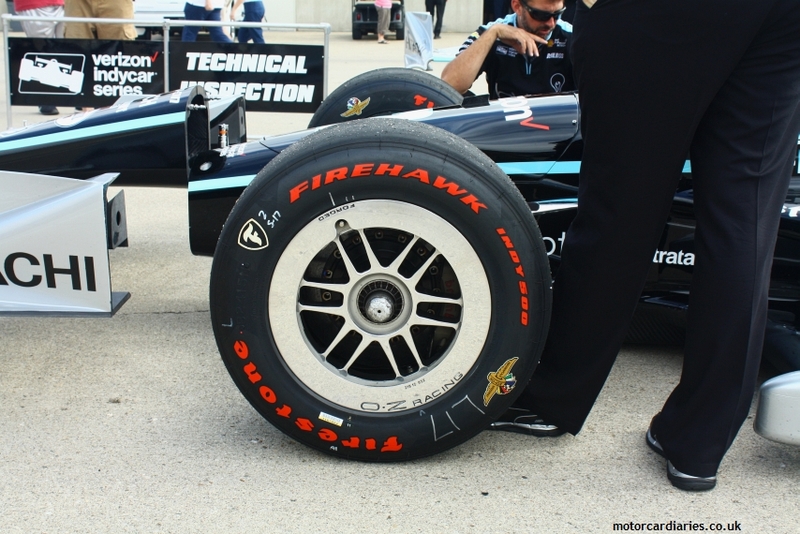 This means dropping into turn one wide open at something in the order of 230mph. Seeing and hearing the cars scything through there with total conviction and no hint of a lift is enough to moisten my eyes. 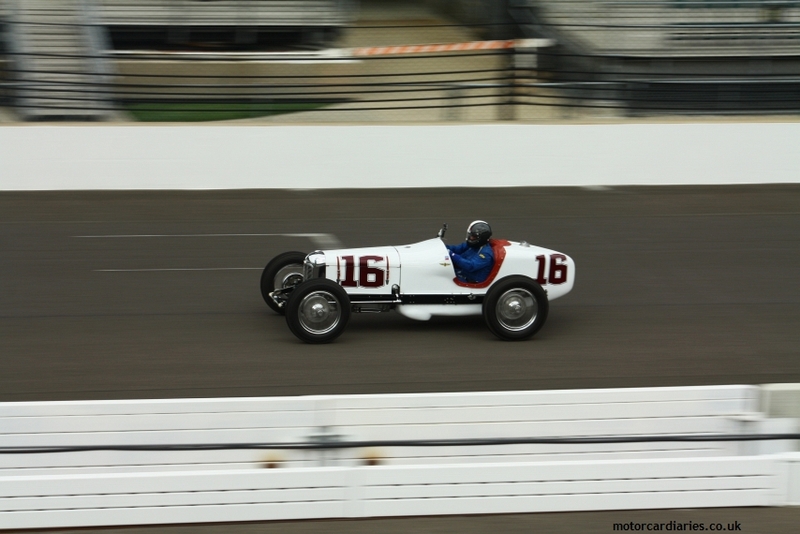 The efficiency of movement and outright speed doesn’t become normal – even after 200 laps. If the spectacle of one car turning 220mph laps isn’t enough to give me a lump in the throat, the actual racing does an equally convincing job. 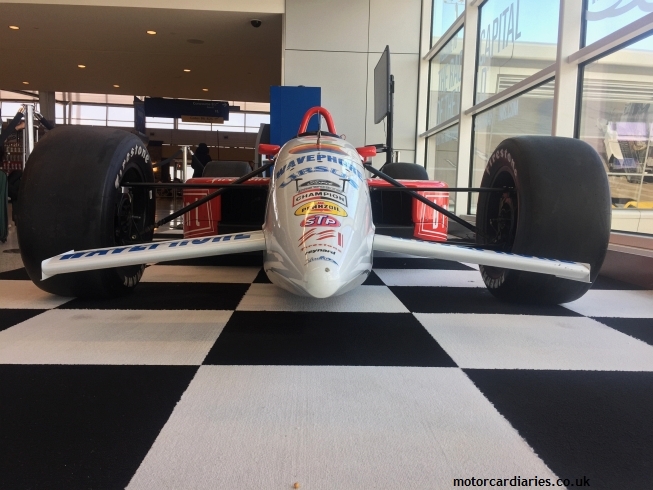 The pack is pretty evenly matched but it’s apparent from the off that you’ll need a Honda engine if you’re to stand a chance – and ideally one sitting in the back of an Andretti Autosport Dallara. 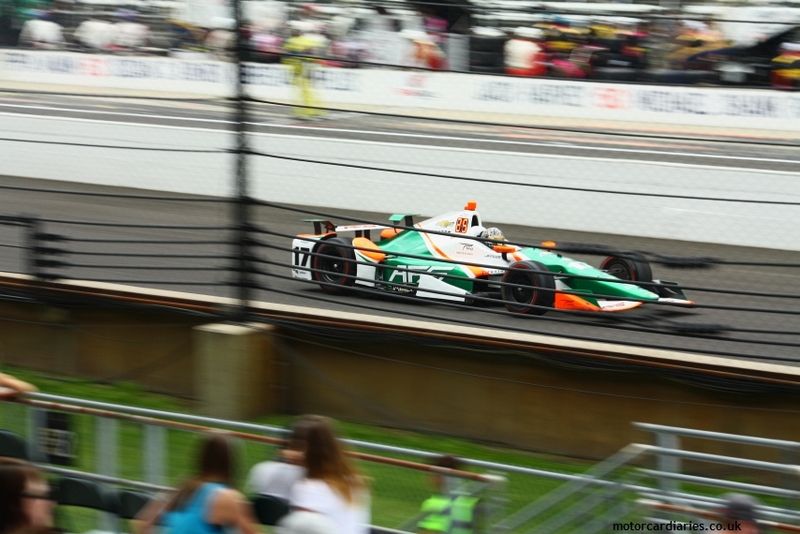 Pole sitter Scott Dixon is in the mix while fellow front row starter Ed Carpenter drops back. 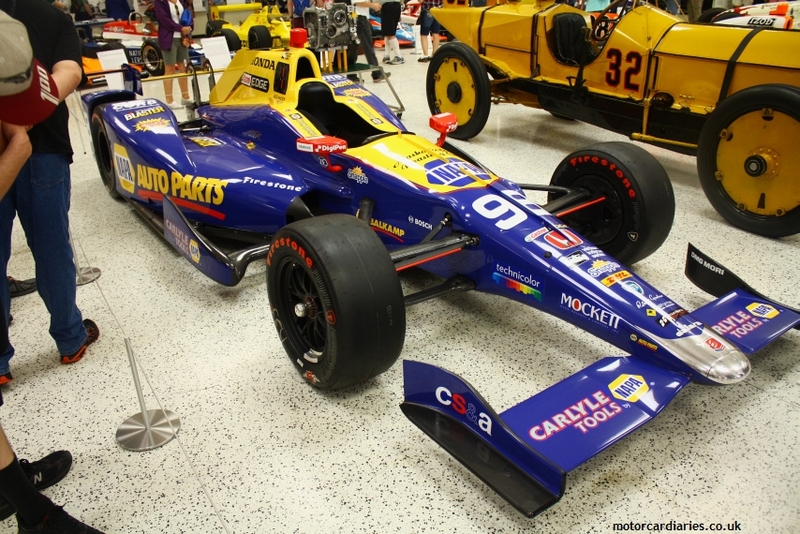 As the race develops, the Andretti Autosport runners really come to the fore. 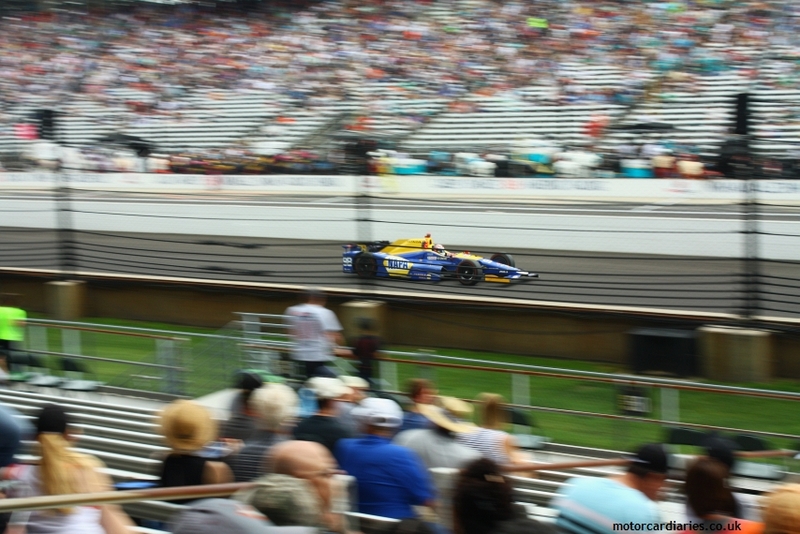 Alexander Rossi hits the front and is joined by our transatlantic hero, Fernando Alonso. 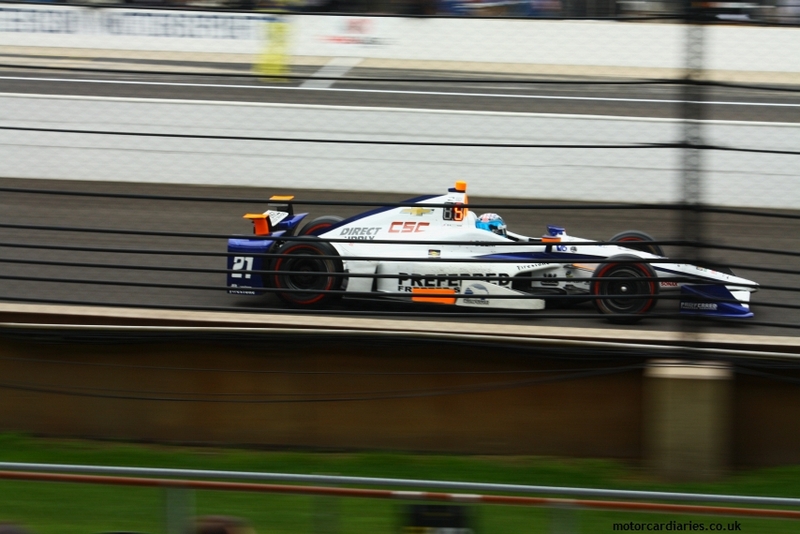 A little way back their team mates, oval master Ryan Hunter-Reay, and Takuma Sato are well in contention. It’s at this stage that Alonso becomes a genuine victory contender. He started the race slowly, losing a couple of places on the first lap before slowly picking off his rivals. His composure in these dog fights is remarkable – he looks comfortable running way low on the apron and isn’t afraid to look around the outside of other cars into that fearsome turn one. His spatial awareness is amazing and at no stage does his judgement look questionable. Three wide down the front stretch? He looks born to it. The race runs green for 50 laps and the pace is absolutely fierce. 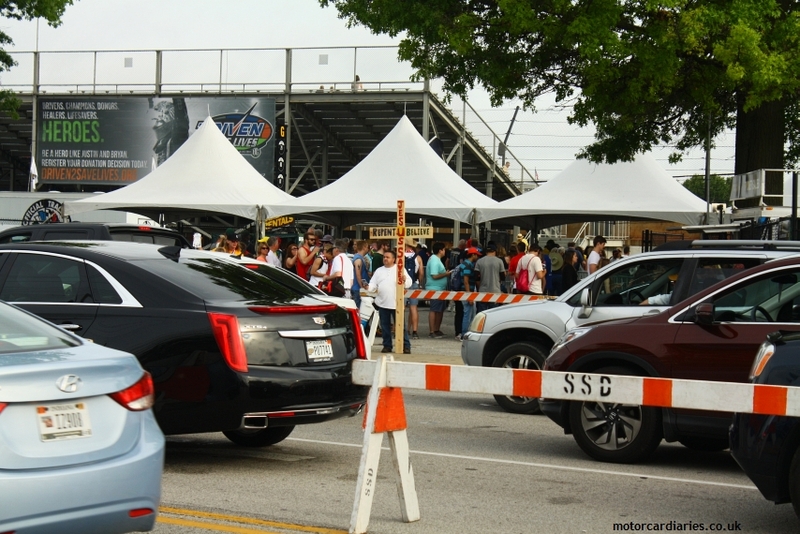 It’s a war zone out there with passes everywhere; they say the Indy 500 chooses its own winner…today the drivers are forcing the issue. Suddenly the big screens are broadcasting something that looks akin to an aviation accident. 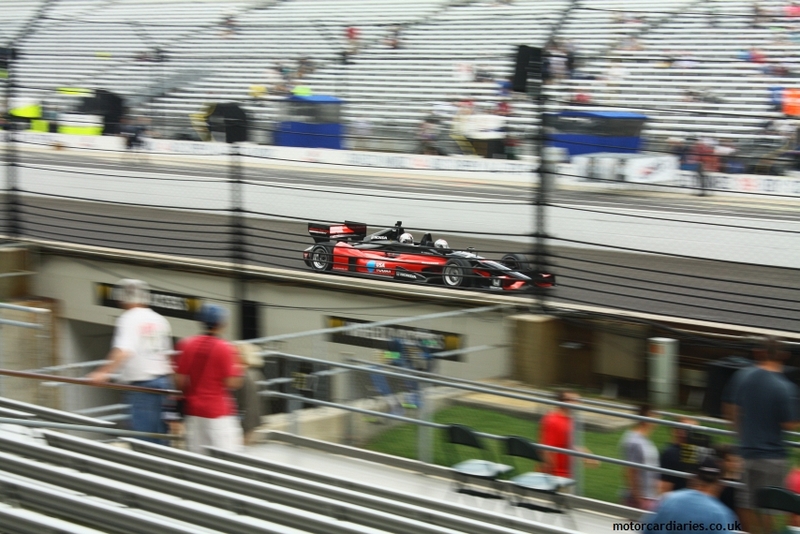 Scott Dixon is flying upside down through the air before landing with sickening force on the concrete barrier inside the chute between turns one and two. 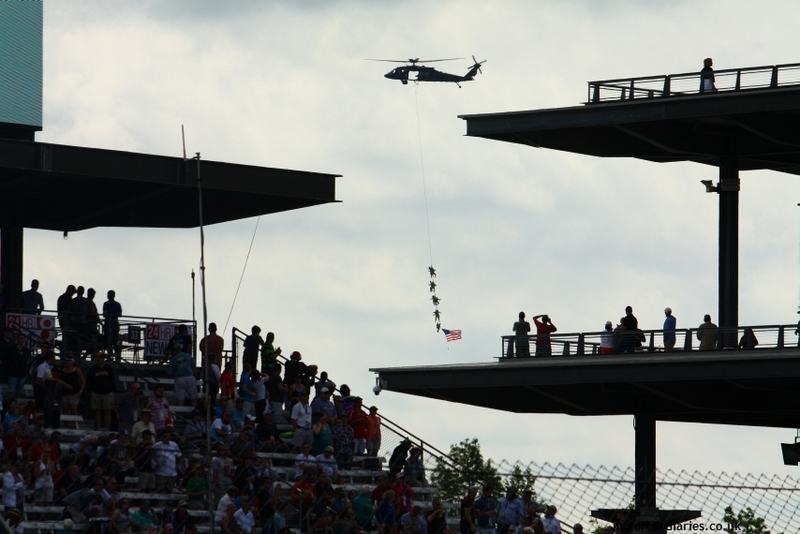 The crowd’s gasps are audible over the sound of the engines. Far louder, though, are the cheers when the Kiwi emerges from his wrecked Dallara, a victim of extreme misfortune to be out of the race but infinitely greater fortunate to be walking away from a shunt on a catastrophic scale. 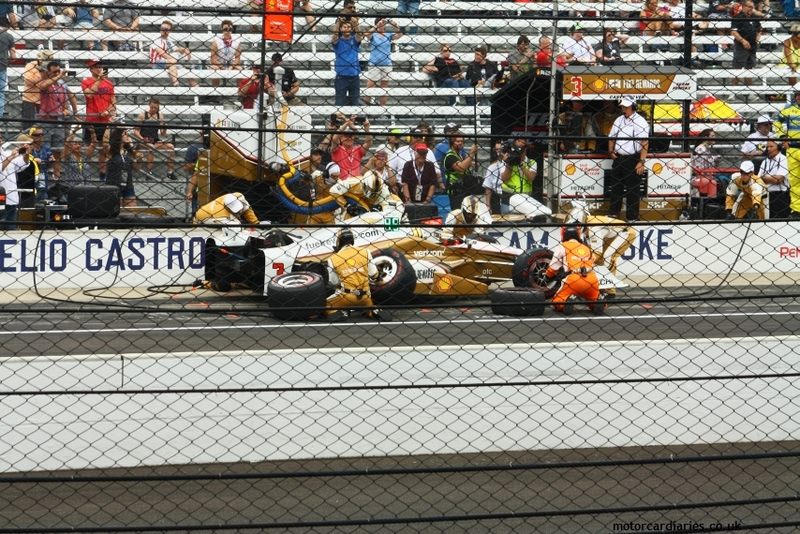 The catalyst for Dixon’s accident, Jay Howard, is out while Penske favourite and celebrity dancer, Helio Castroneves, literally dives under Dixon’s car while it is mid-flight. 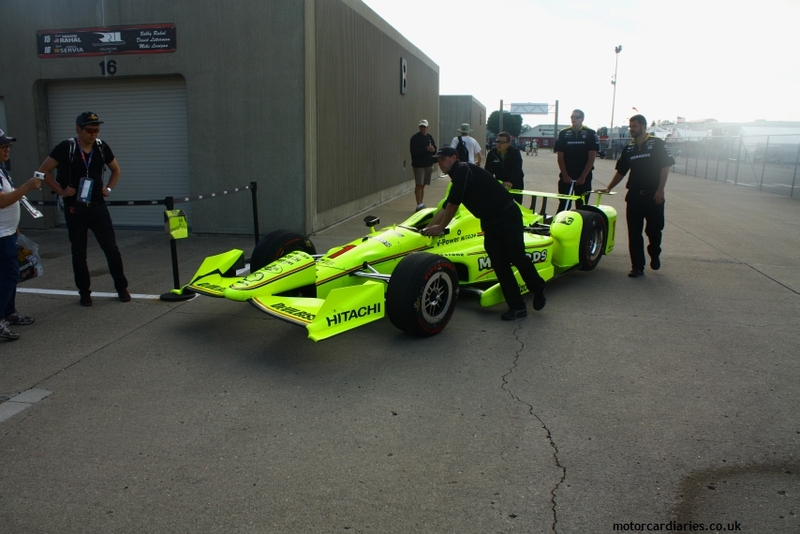 This is a terrifyingly vivid illustration of the speed and energy of an IndyCar at flat chat on a superspeedway – and the consequences of any error. 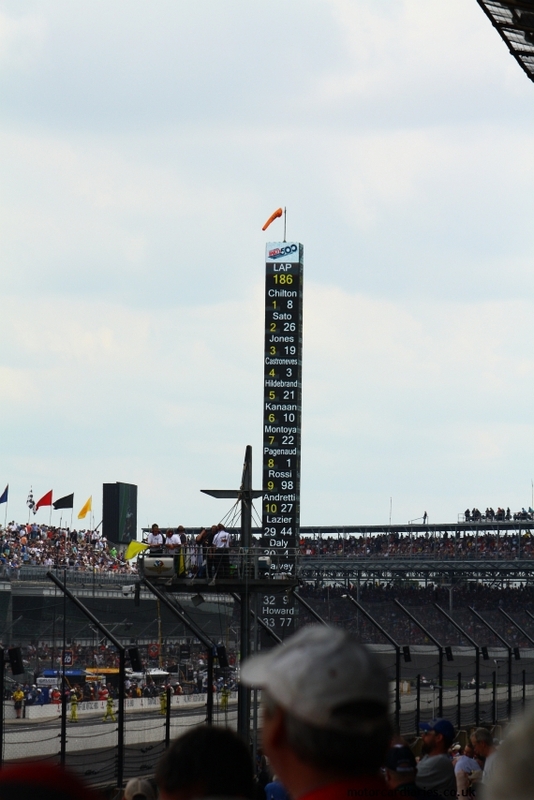 The race is red flagged while debris is cleared, with Alonso leading the pack. 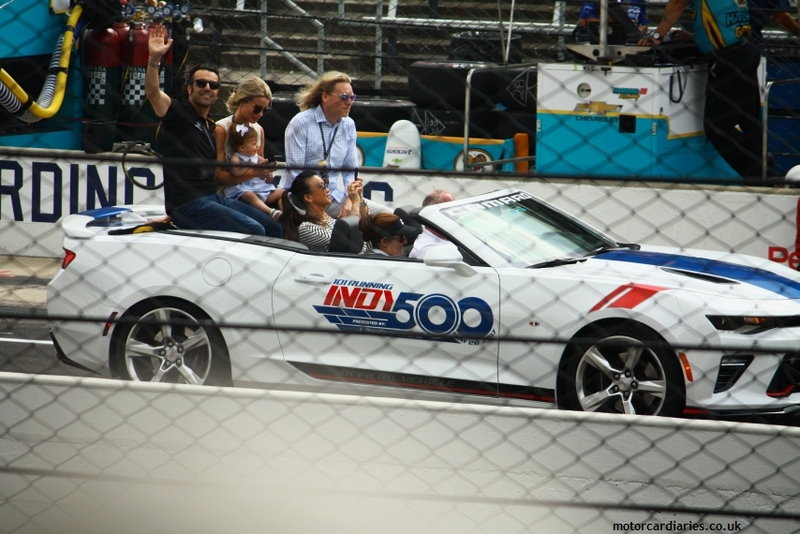 He heads the train when the action restarts and looks comfortable leading the Indianapolis 500. This is a driver of very special talent. 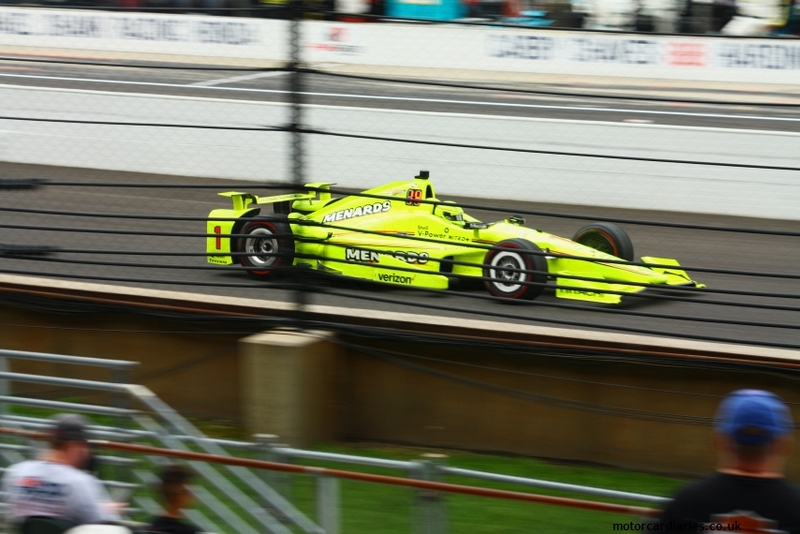 It’s at this stage that you start to appreciate that Indy really is an endurance race, albeit one happening at outrageous speed. A lap is ticked off every 40 seconds, not every three and a half minutes like Le Mans, but the race runs for over three hours. Strategies start to diverge and drivers are shuffled around the pack. 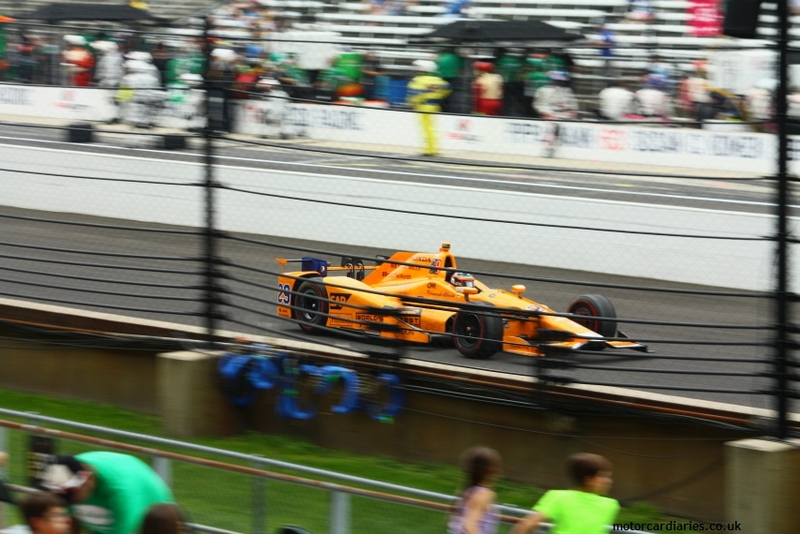 Dixon’s absence is noticed but a bigger shock is the sudden expiration of Hunter-Reay’s Honda, a chap who looked every inch the possible winner. Nervous glances are exchanged on the pitwall at Andretti Autosport. During this middle phase of the race, Rossi suffers a long pit stop and drops down as low as 24th while Alonso finds himself outside the top ten for the first time, having been caught out by an inopportunely timed full-course yellow. 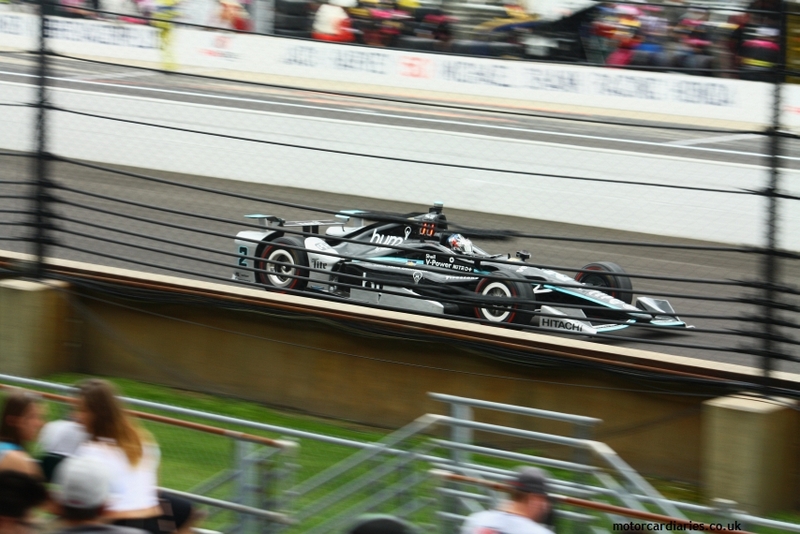 To the surprise of many, Max Chilton leads more laps of the 2017 500 than anybody else. In fact, with less than 15 laps to go, it feels like we might be crowning an unlikely winner. Having beaten up Daniel Ricciardo on occasion in British F3, Chilton’s talent has been apparent for years but his reputation as a pay driver sadly precedes him. While Chilton is composed, he doesn’t look like he quite has the absolute speed to be an outright winner on race day and he is soon under threat from the old hands behind him. Not before the latest big shock though: Alonso toils down the front stretch in front of us, a gentle plume of smoke rising from the back of his Honda engine. Having left the claustrophobia of a disastrous F1 season with the Japanese giant, he has once again been blighted by its unreliability. It’s an enormous shame and no reward for a phenomenal performance from team and driver. The Spaniard is running seventh and still a very credible contender when the engine expires…one of motor racing’s most vexing ‘what ifs’. 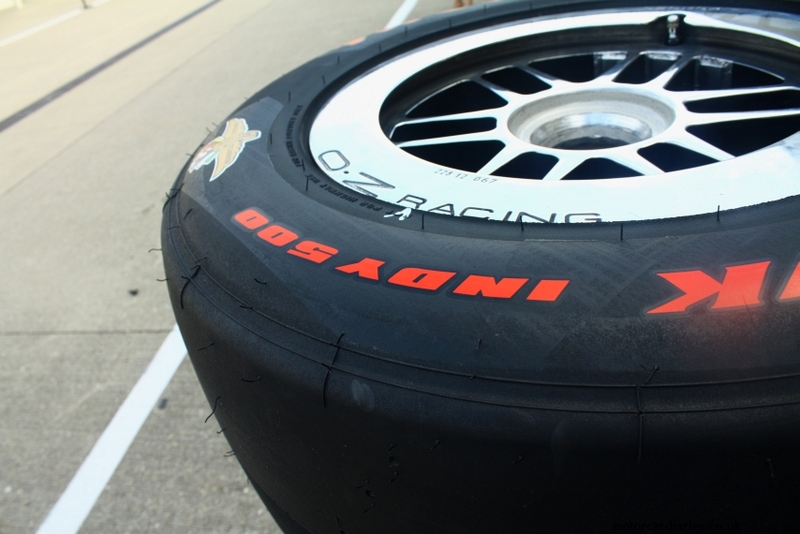 With the orange arrow of Alonso out, Rossi mired in the pack and Hunter-Reay another Honda victim, it’s for Sato to uphold the honours for a team which has dominated on pace all day long. In the bad old days, one wouldn’t have bet a dime on Sato handling pressure on this scale but his progress during the latter stage of the race has been uncharacteristically serene. 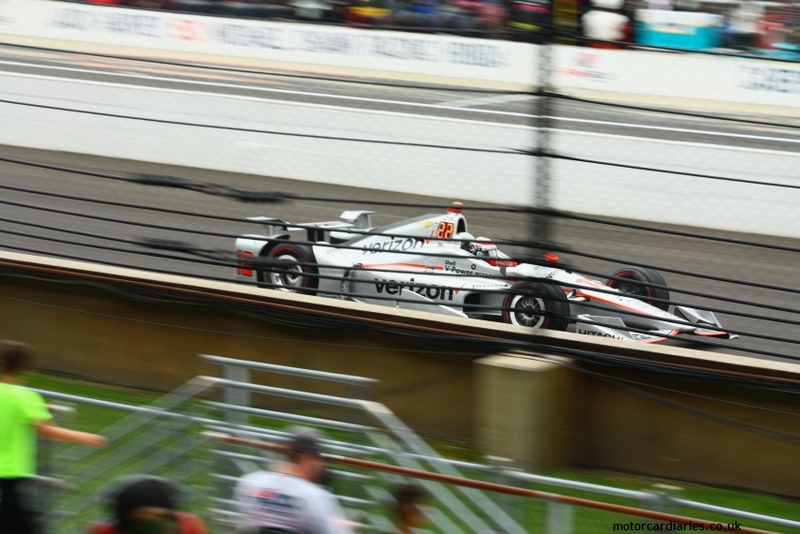 First Castroneves dives past Chilton to take the lead. It’s an amazing effort from the Brazilian; Penske’s beautiful machines have been off the pace all month and never look like a factor. 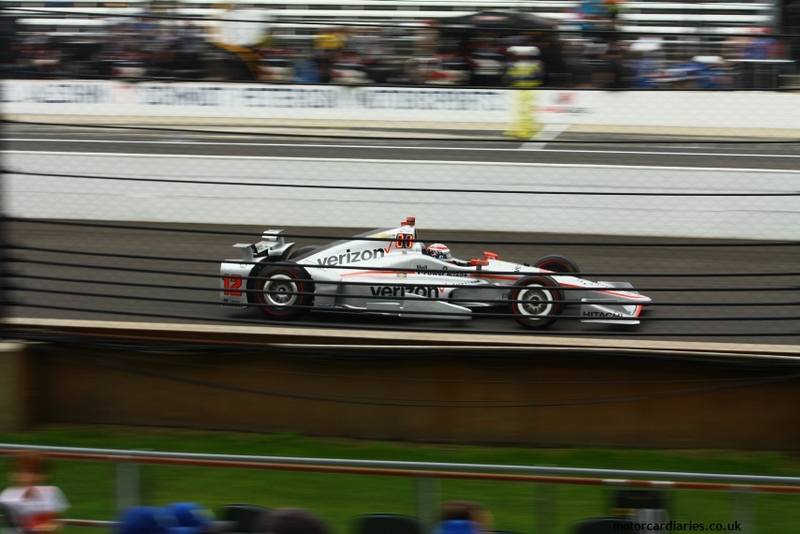 Castroneves is a Brickyard legend, though, and puts a recalcitrant car where it has no right to be. 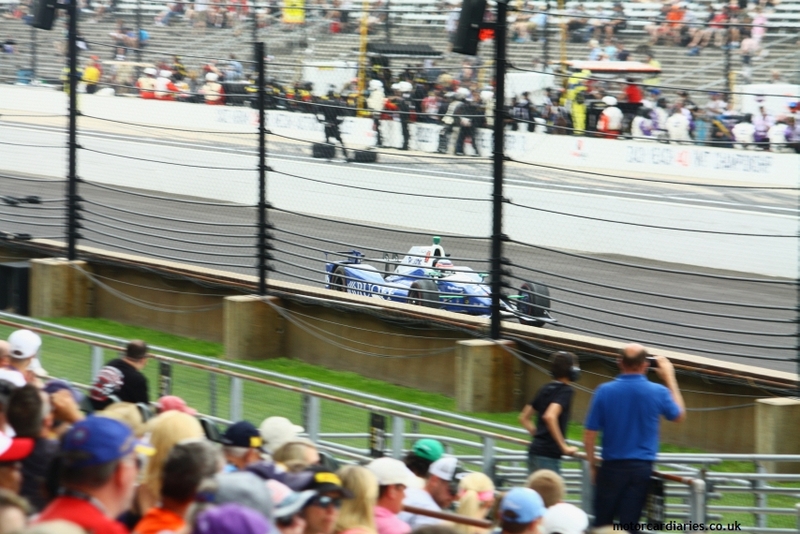 In spite of Castroneves’ heroics, Sato drafts past him down the back stretch with five to go. Can he handle the pressure? To everyone’s relief, he can. 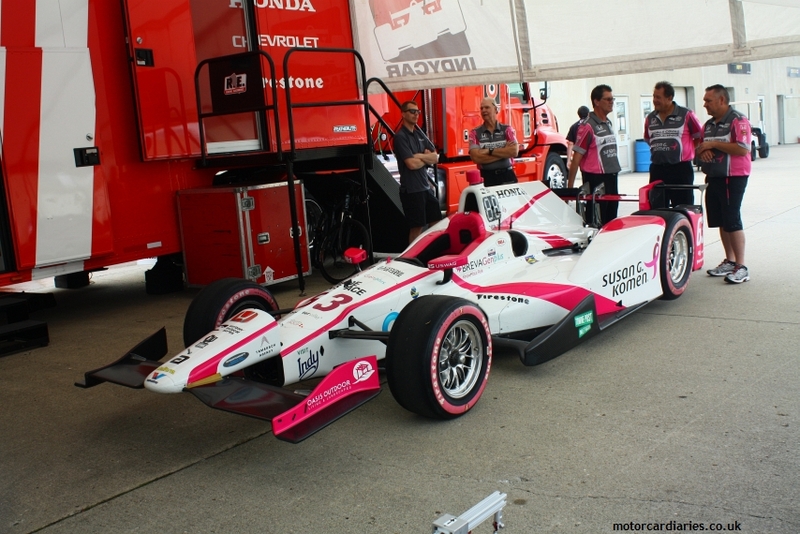 The Japanese who so thrilled us in British F3 has claimed the biggest scalp in American racing – and done so convincingly. 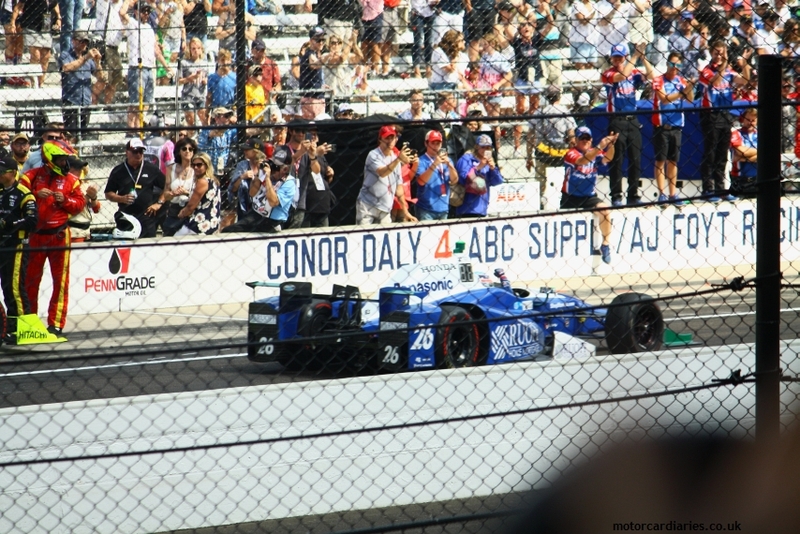 Every driver in that race has earned their stripes but Sato has played it perfectly – a textbook demonstration in how to win on a superspeedway. It’s hard to compute everything we’ve just witnessed: the disorientating speeds; the frantic energy of the racing; the 15 different leaders; the 871 individuals passing manoeuvres. This is one of those races where you find yourself panting; breathing becomes a distraction from the action. 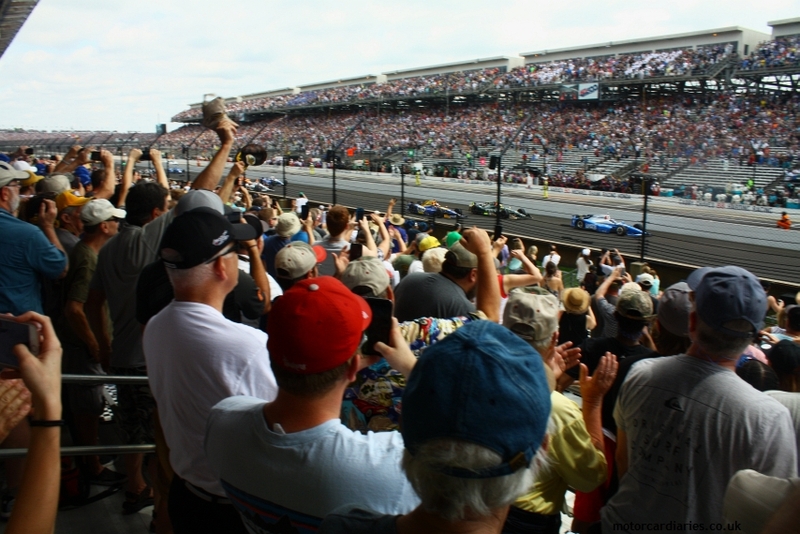 It ranks as the most exciting race I’ve ever seen in person and without question the facility’s bold claim that it provides ‘the greatest spectacle in racing’ is no immodest boast. It’s so refreshing when a proper bucket list event exceeds all expectations. 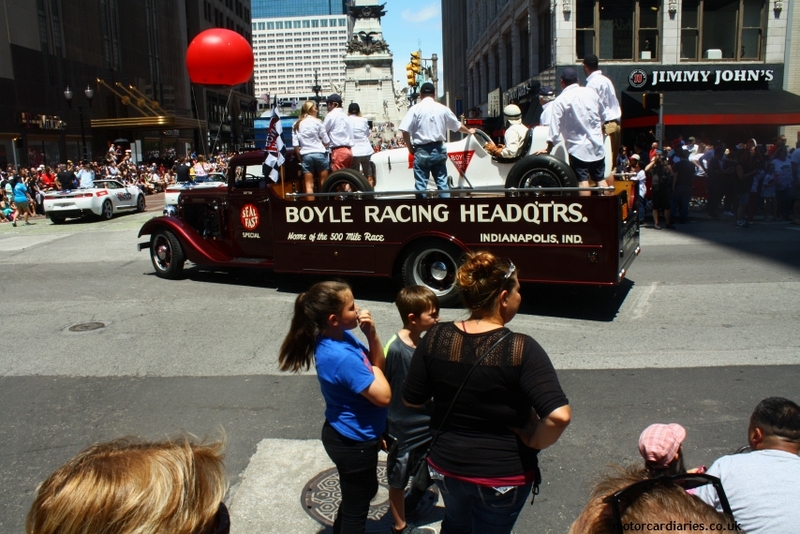 Indy is truly staggering and one of the very few places which make you feel genuinely emotional. If you have the chance to go, book tickets now…don’t hesitate: it’s something every petrolhead simply must experience in their lifetime. We started the weekend feeling trepidatious about whether we would get to see a race at all after the horror weather forecasts. 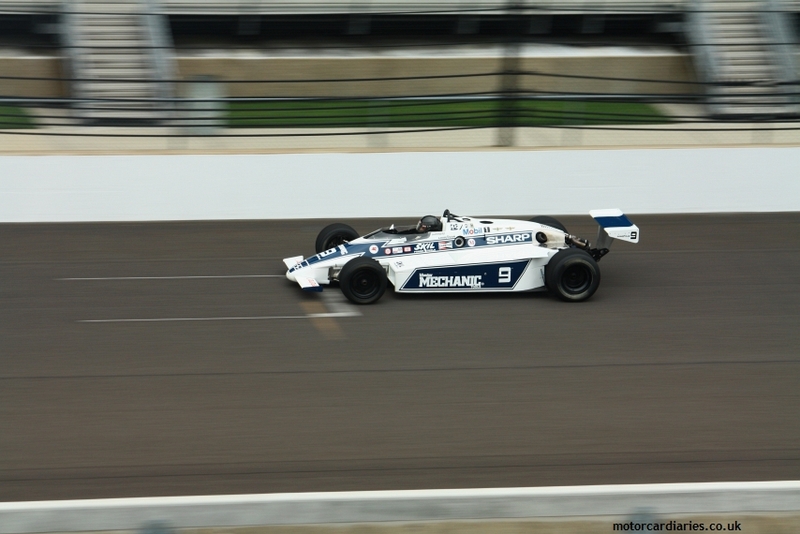 Mercifully we see one of the all-time great Indy 500s. 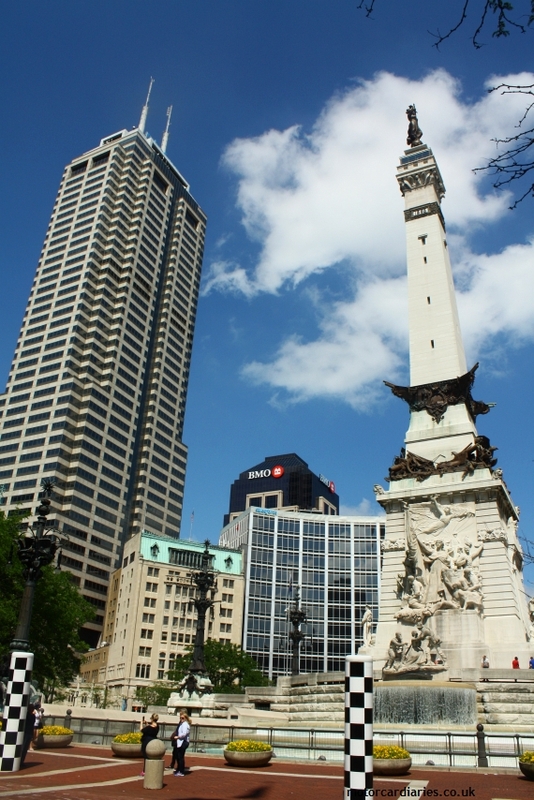 The sun shines through Sunday and Monday so we explore downtown Indianapolis before catching our flight back to the UK. 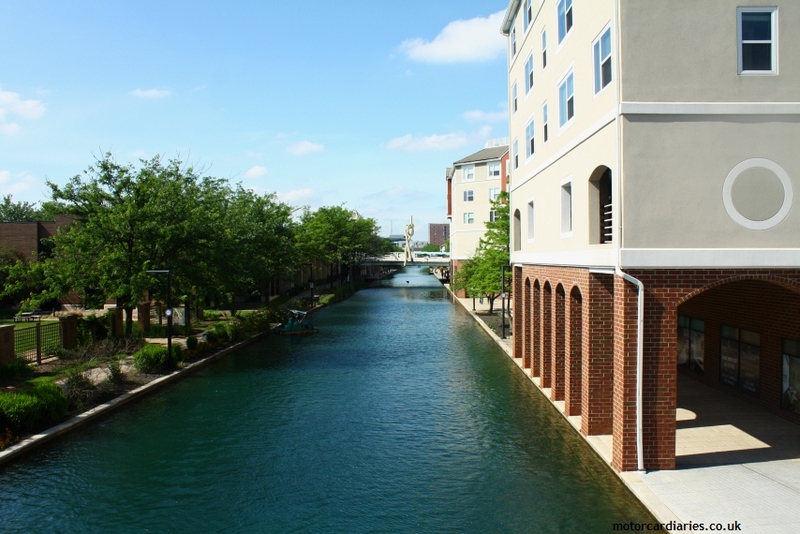 It’s a quite charming city and very clean with pleasant public spaces and impressive architecture. I’m not sure it would warrant a special trip but a few hours spent exploring certainly don’t feel wasted. 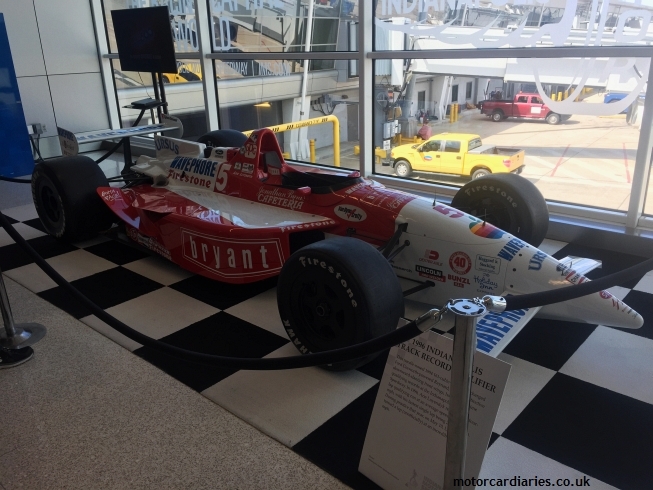 Meanwhile, the airport is a startling building, full of light and with Arie Luyendyk’s 1996 Reynard proudly on display. 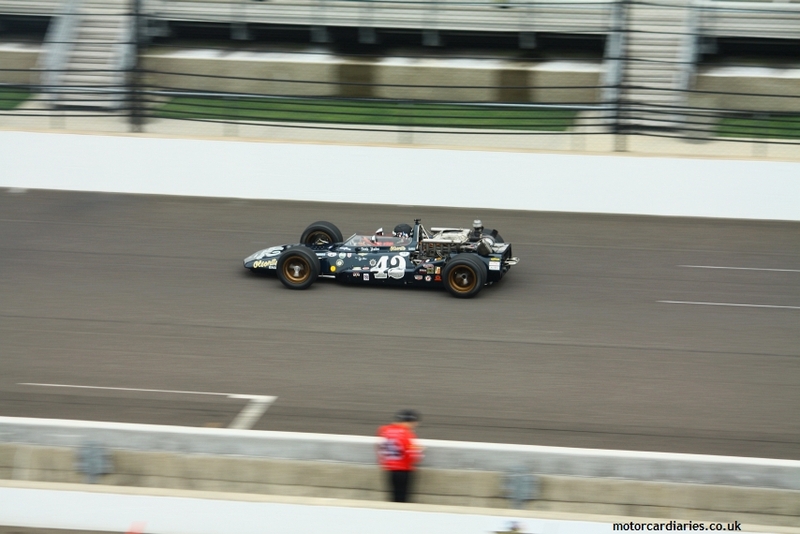 This is the fastest vehicle ever to lap the Brickyard, with a one-lap average of over 239mph. *Gulp*. Honeymoon over; back to reality. 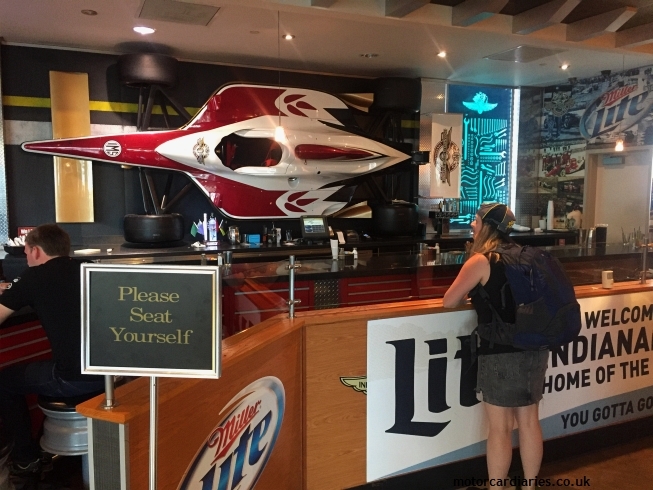 There is some comfort though – while waiting in the airport to board our plane home we secure ferry tickets to the Isle of Man TT 2018. 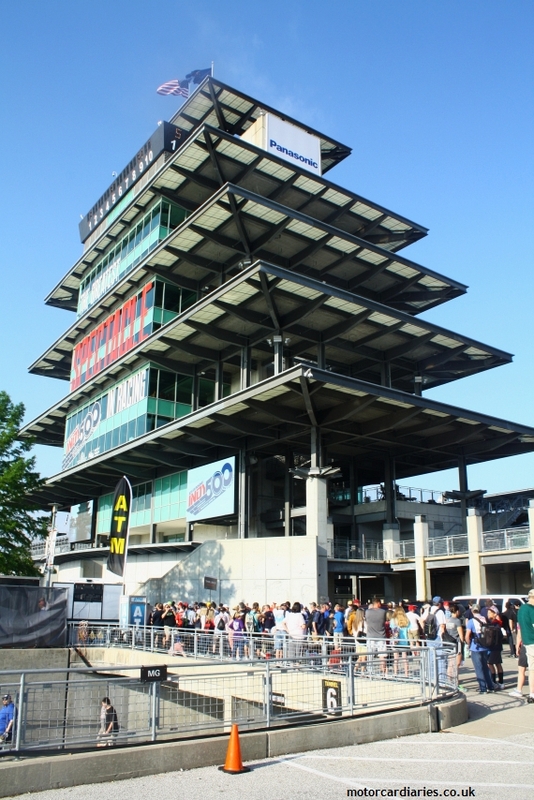 Let’s see how 133mph laps of the Mountain Course compare to 233mph laps of the Brickyard. Just like Indy, only true gladiators need apply.